Sheffield, 31st July 2014: Northern Rail's 158753 arrives with 1Y25, the 11:05 Leeds - Nottingham service, passing Network Rail's 31105 with a short test train visiting North Lincolnshire lines, and East Midlands Trains' 222005, awaiting departure with 1C45, the 12:29 service to London St Pancras. 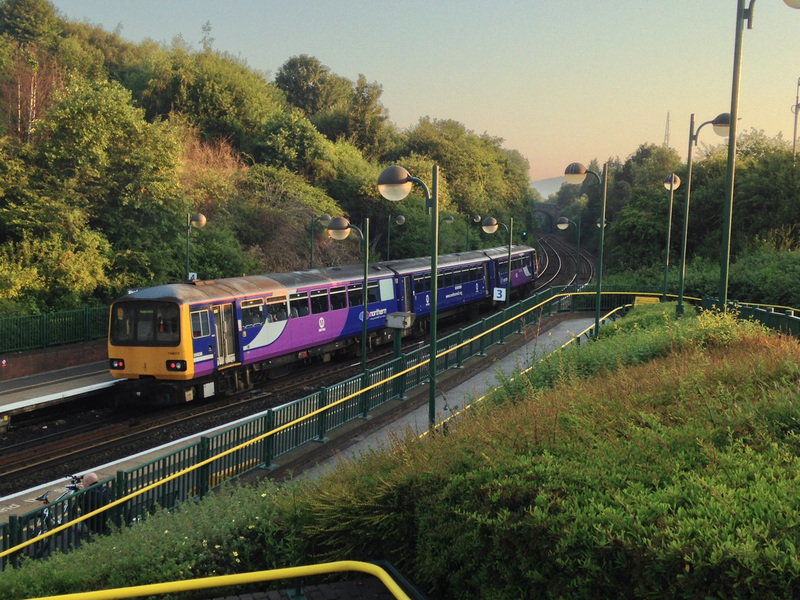 Chapeltown, 19th July 2014: Northern Rail's 142092 arrives with 2B60, the 19:36 Sheffield to Huddersfield service. 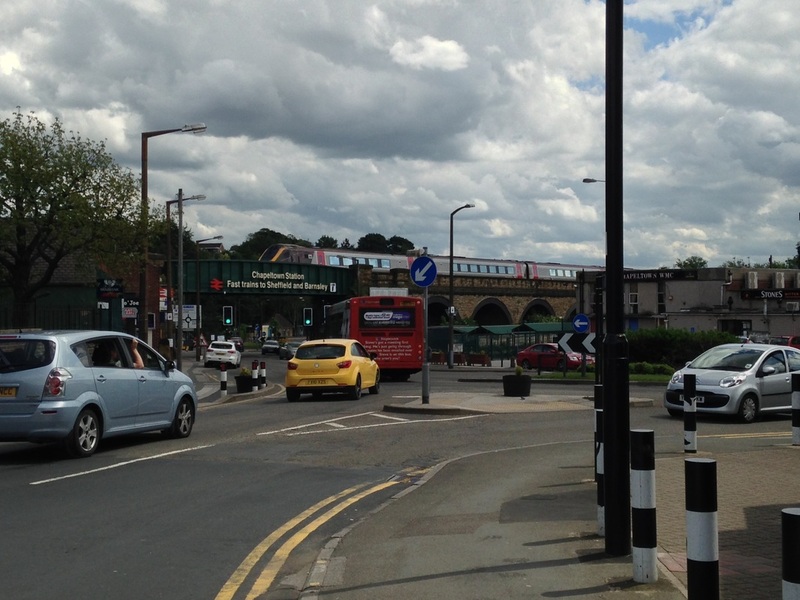 Chapeltown, 8th June 2014: Diverted away from its usual route via Moorthorpe due to engineering works, a Cross-Country Trains 220 passes over the viaduct with a southbound service. Wakefield Kirkgate, 9th June 2014: Northern Rail's 144021 arrives with 2L12, the 06:30 Worksop - Leeds via Barnsley and Castleford service. Work on renovating the station buildings and entrance is still ongoing. 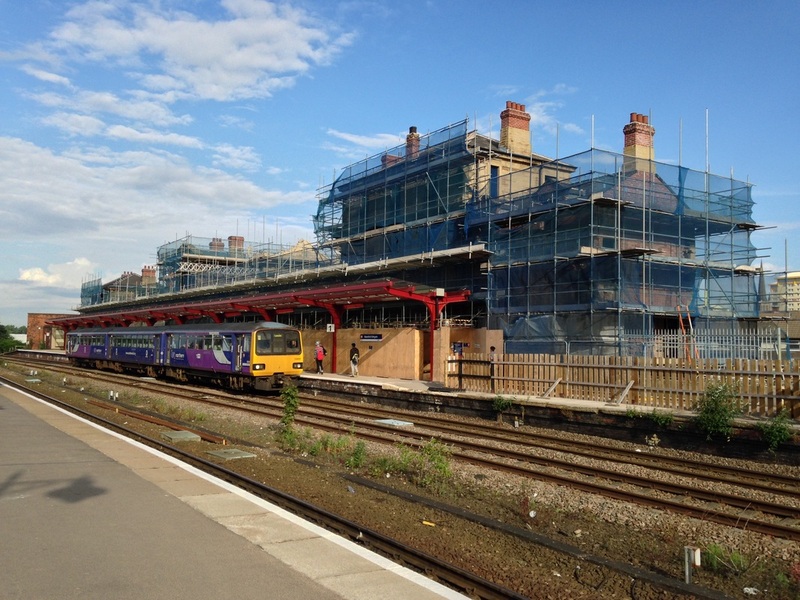 Wakefield Kirkgate, 15th June 2014: A pair of Northern Rail 158s (believed to be 844 and 845), depart with 1M98, the 10:17 Sheffield to Carlisle via Barnsley and Leeds service. Sheffield, 29th June 2014: with 142096 and 142064 stabled in the background, the first and last 144s (001 and 023) await their northbound Sunday departures. Note the door left open on 142096 - this was on a centre stabling road between platforms 5 and 6! 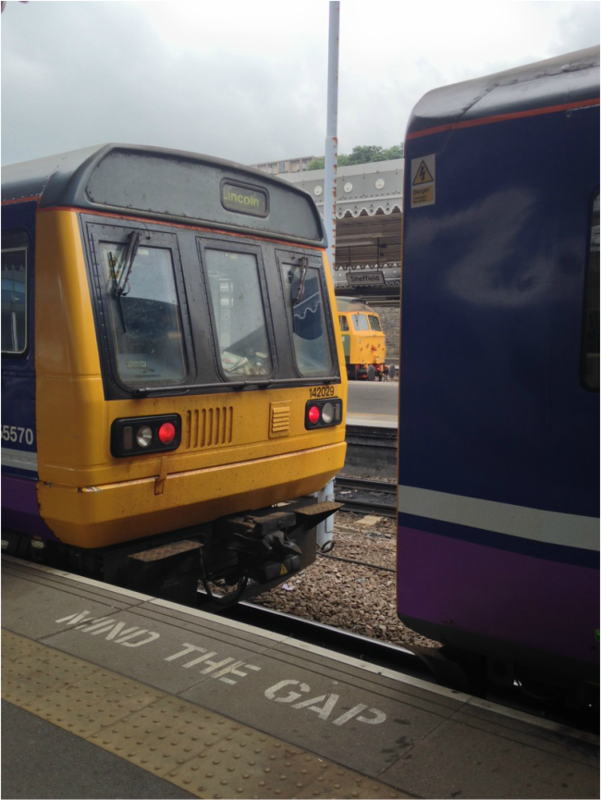 Sheffield, 27th June 2014: Northern Rail's 142029 awaits departure with 2P65, the 11:19 Scunthorpe - Lincoln Central, whilst 150210 is prepared for 1L82, the 12:50 service to Leeds via Barnsley. In the background can be glimpsed Riviera Trains' 47812, on loan to GBRf, waiting to leave for Worksop on a driver-training run. Scunthorpe, 27th June 2014: First Trans-Pennine Express's 185101 arrives with 1B75 the 10:26 Cleethorpes - Manchester Airport service. 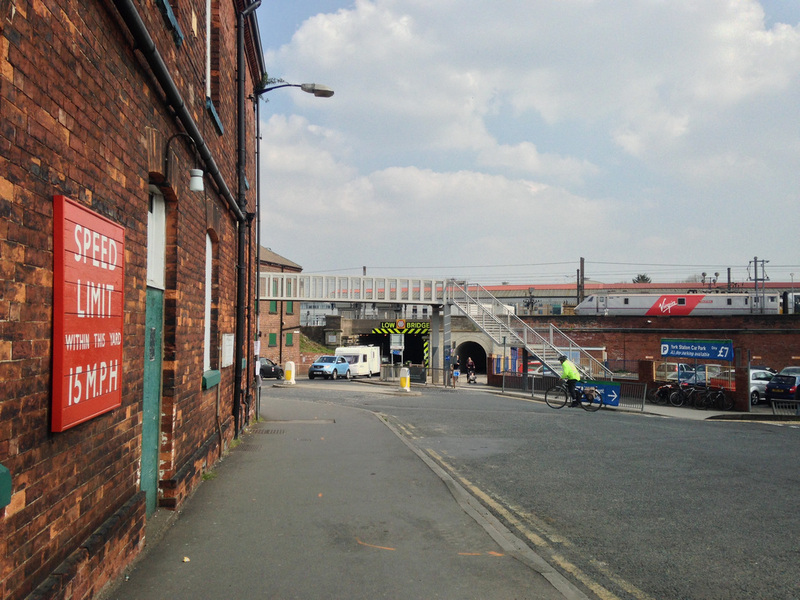 Behind the station building can be seen the former site of vast marshalling yards in this industrial town. Scunthorpe, 27th June 2014: Two products of the 1980s that don't seem to have aged well! 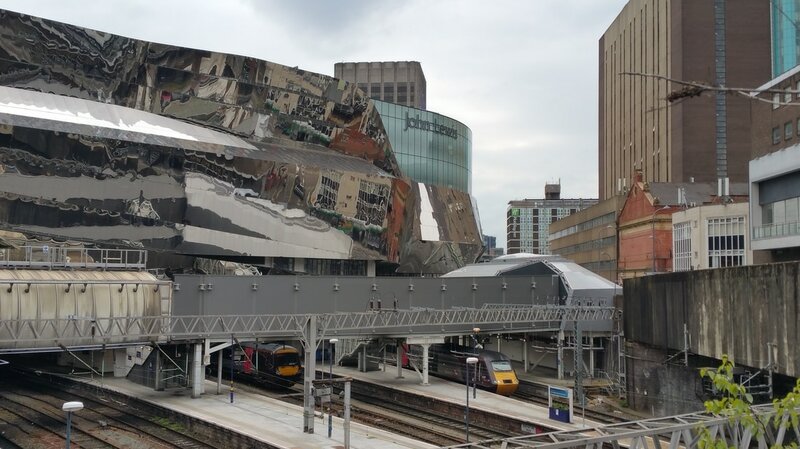 An anonymous office block overlooks Northern Rail's 142029 as it lays over before working back to Sheffield with the 11:19 departure. 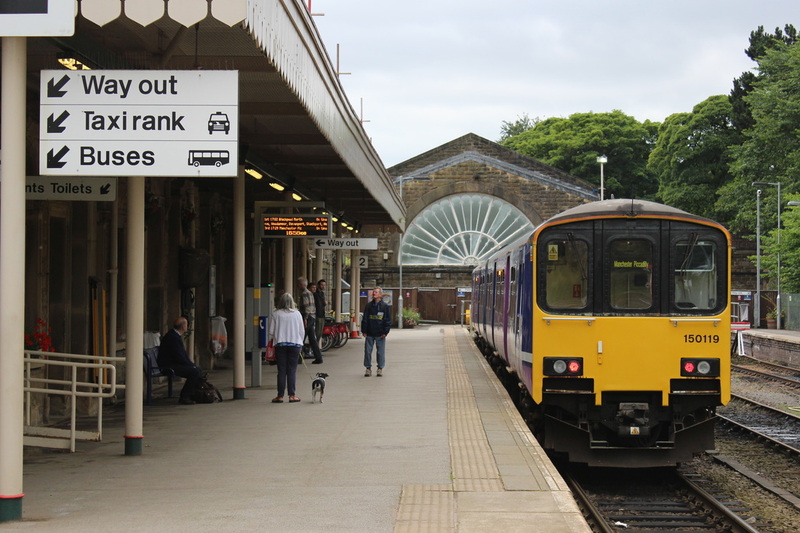 Barnsley, 22nd June 2014: Far removed from the semi-derelict Exchange station of the 1970s, the bright and airy Interchange of 2014 is shown to good effect as 144017 awaits departure with the 22:28 service to Sheffield. 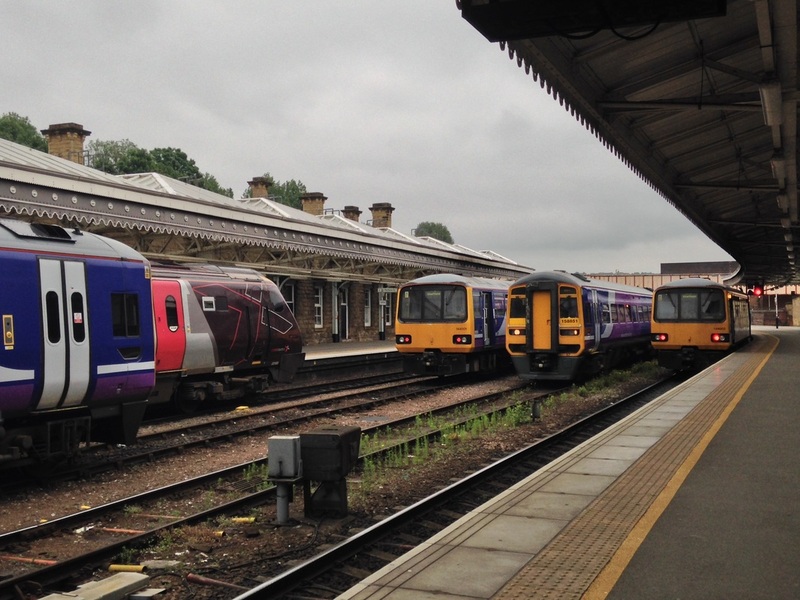 Sheffield, 15th June 2014: The former Midland station can become very congested at busy periods, but in this scene, three of the five trains are stabled - Northern Rail's 158905 and 144001 await duties on Monday morning, whilst 144002 has just arrived from Leeds. 158851 is manoeuvring around 144002 from the small DMU depot to platform 1 to form 2C36, the 16:24 stopper to Goole, and in the background, Cross-Country Trains' 221120 prepares to depart with 1S49 the 09:30 Penzance - Edinburgh Waverly. 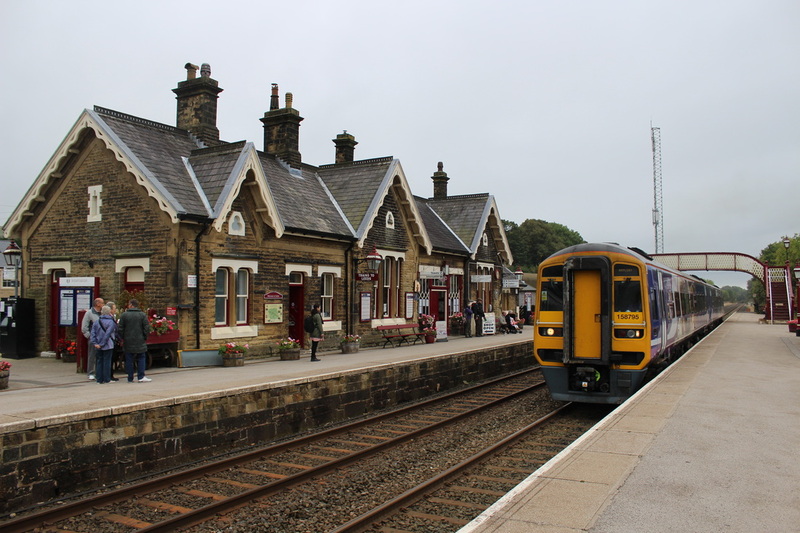 Grindleford, 15th June 2014: Despite being a very busy cross-country route, the former Midland Railway line from Sheffield to Manchester via the Hope Valley is one of the most picturesque in the U.K. Providing the local service, Northern Rail typically sends out 142s, such as 142060, seen departing with 2S33, the 12:14 Sheffield - Manchester Piccadilly service. Sheffield, 16th December 2013: Direct Rail Services' 47813 'Solent' awaits departure with a Northern Belle charter bound for Stockport, with 47853 'Rail Express' on the rear. This pair of locos would return seven months later, working a special in connection with the Tour-de-France. Rotherham Masbrough, 8th June 2013: Direct Rail Services' 47802 'Pride of Carlisle' leads the return leg of a Scarborough - Bristol Temple Meads charter, with 47805 'John Scott' on the rear. Kilnhurst, 8th June 2013: Preserved ex-LMS 'Duchess' 46233 'Duchess of Sutherland' powers a Derby - Newcastle charter along the busy stretch of the former Midland Mainline between Rotherham and York. 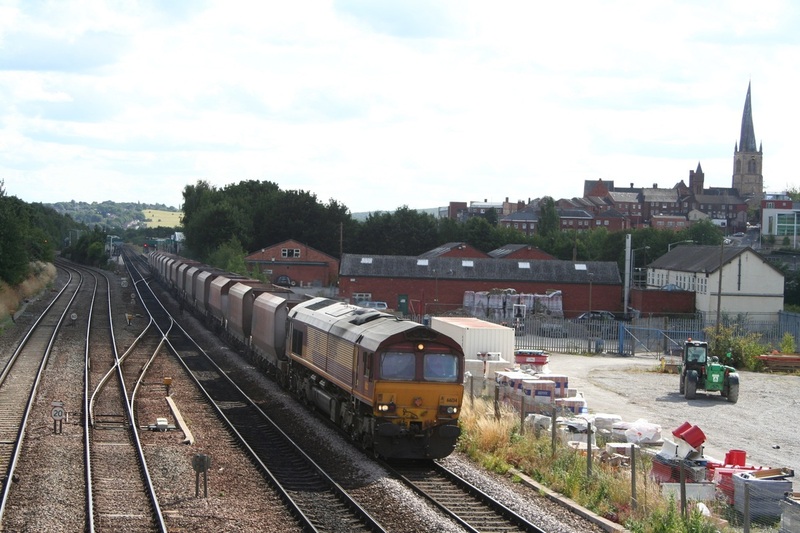 Chesterfield, 15th August 2013: Wearing now-defunct EWS livery, 66134 wheels an empty limestone train past the famous 'Crooked Spire' towards its Peak Forest destination. Meadowhall Interchange, 24th August 2014: First Trans-Pennine's 185147 leads classmate 185144 into Meadowhall Interchange with 1B74, the 10:44 Manchester Airport - Cleethorpes. 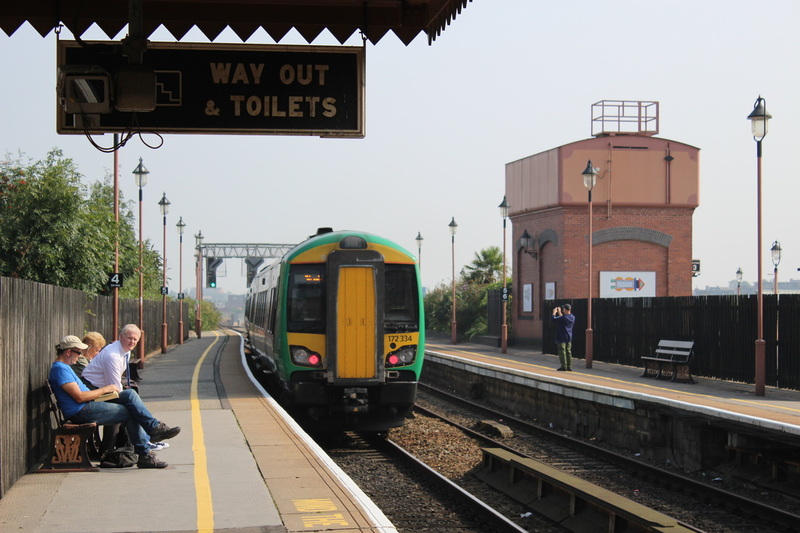 Whilst pairs of class 170/3s are commonplace on these services, pairs of 185s are rare, and only usually occur on Sundays. 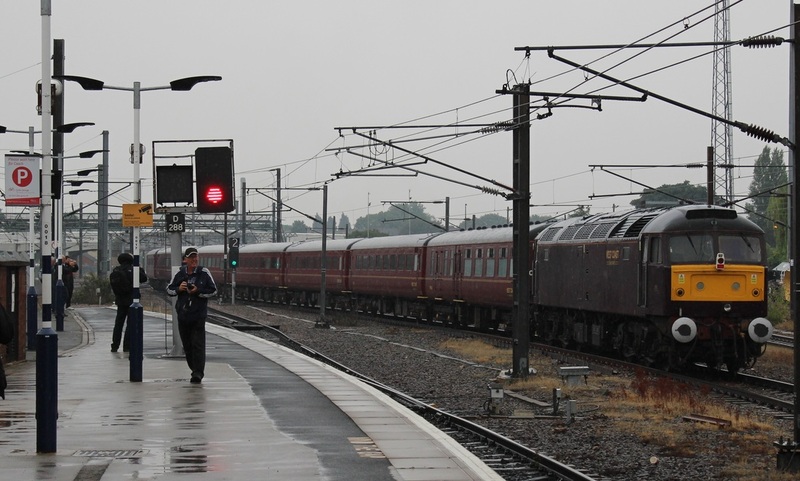 Rotherham Masbrough, 29th July 2014: Owned by Direct Rail Services, but painted in the 'Northern Belle' brown/cream livery for working the luxury charter train, 47790 'Galloway Princess' leads 1Z94 08:17 Edinburgh Waverly - London St Pancras southwards with 57307 on the rear. 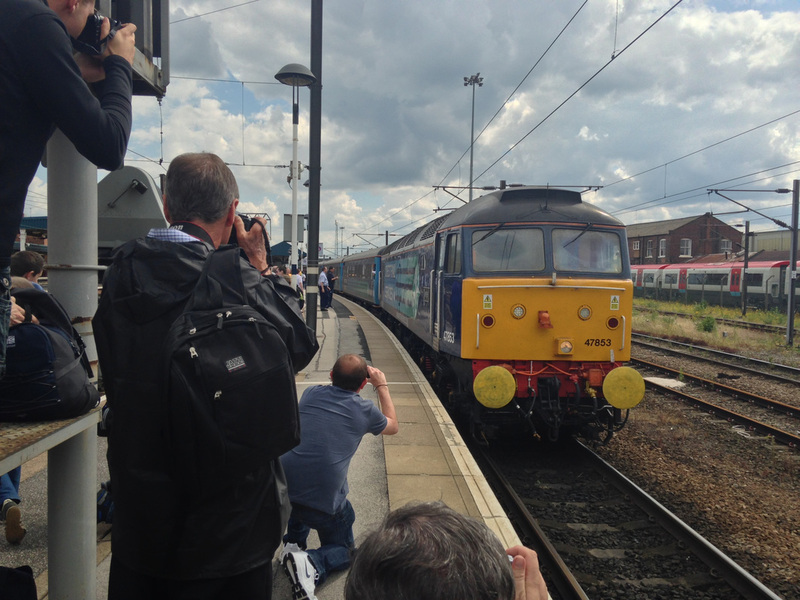 Doncaster, 6th July 2014: Photographers swarm around Direct Rail Services' 47853 'Rail Express' after it had arrived with 1Z84, the 14:00 service from Manchester Piccadilly. 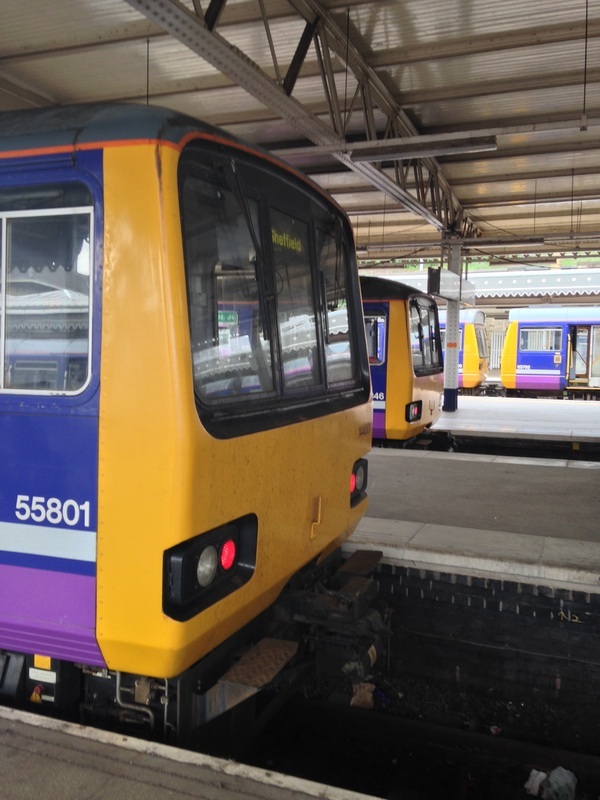 This additional working was in conjunction with the Tour-de-France, but ironically, was largely empty between Sheffield and Doncaster, save for about 100 enthusiasts enjoying a ride on a 'proper' train! 47813 'Solent' was on the rear of the 6-coach formation. Meadowhall Interchange, 1st July 2014: Northern Rail's 144015 departs with 2B32, the 05:36 Sheffield to Huddersfield service. 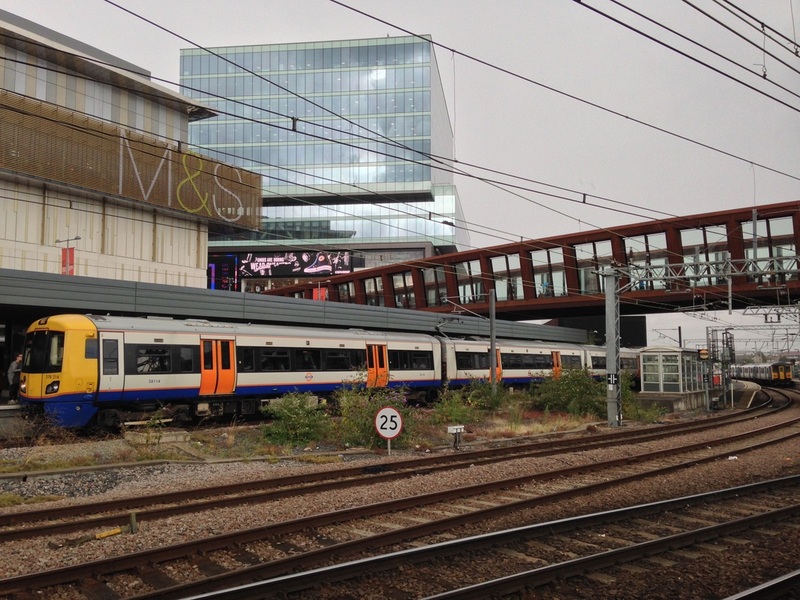 Stratford, 18th August 2014: A site once synonymous with the vast locomotive works, Stratford is now home to the Olympic Park and a large Westfield shopping centre, besides a huge transport interchange encompassing London Underground, London Overground, Greater Anglia, the Docklands Light Railway and South Eastern HS1 services! Working a service that ten years previously would have worked to North Woolwich, London Overground's 378214 prepares to depart with 2N71, the 14:25 to Richmond via Highbury & Islington, whilst a 317/5 awaits its departure time of 14:30 to Bishops Stortford with 2S34. Penistone, 13th August 2014: With the town of Penistone as a backdrop, Northern Belle liveried 47790 finds itself away from its normal duties, instead providing power for a tour of Yorkshire with observation saloon 'Caroline' as it prepares to cross the 29-arch viaduct. 'Caroline', alias 975025, was built in 1958 as a narrow-width 'Hastings' unit buffet car, but was deemed surplus to requirements in 1964, and was converted to an observation saloon in 1969. It saw use by Prince Charles and Pope John Paul II in the 1980s, and was the first standard gauge vehicle carrying passengers to enter the Channel Tunnel, amongst other unusual duties. New Mills Central, 14th May 2014: Northern Rail's 142s form the backbone of local services throughout the North of England, and 142039 is about to depart with the slightly late 2S23, 10:30 service to Manchester Piccadilly. Rotherham Masbrough, 16th April 2014: With the palisade fencing looking decidedly 'wonky' due to the force from the piles of rubble, Network Rail's 31465 propels a 3-vehicle test train towards Sheffield, as a pair of Cross-Country Trains 220s rapidly recede into the distance with 1S49, the 11:25 Plymouth - Dundee. Crystal Palace, 18th August 2014: The grandiose nature of Crystal Palace (Low-Level) station points to a more illustrious past, as London Overground's 378213 arrives with 9A30, the 12:25 service from Highbury & Islington. 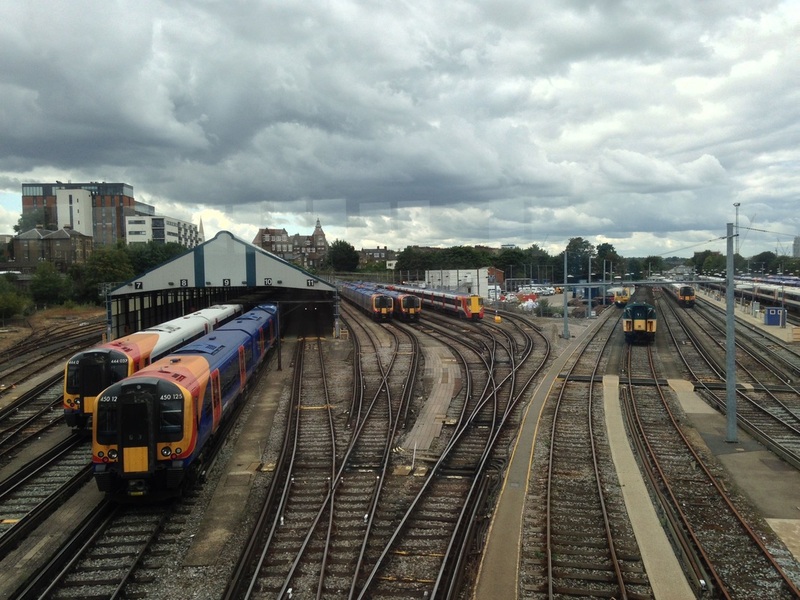 Clapham Junction, 18th August 2014: Members of classes 444, 450 and 458 mingle in the carriage sidings, located in the 'V' of the South-Western lines, awaiting rush-hour duties from London Waterloo, whilst sharing space with a track-machine and preserved class 423, no. 3417 'Gordon Pettitt'. Hope, 23rd November 2014: The Hope Valley stopping services are normally the domain of Newton Heath based class 142s, but members of classes 150 and 156 do turn up on occasion. 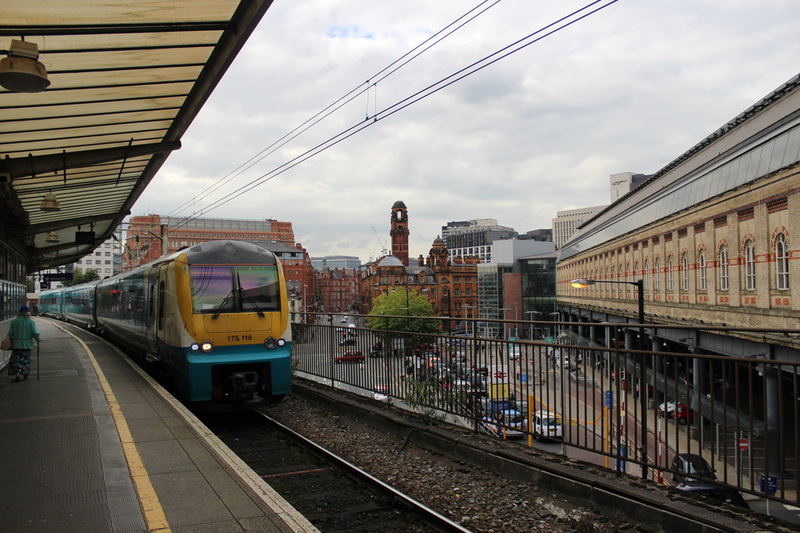 150130 makes a call to pick up half a dozen passengers with 2S34, the 13:40 Manchester Piccadilly - Sheffield service. 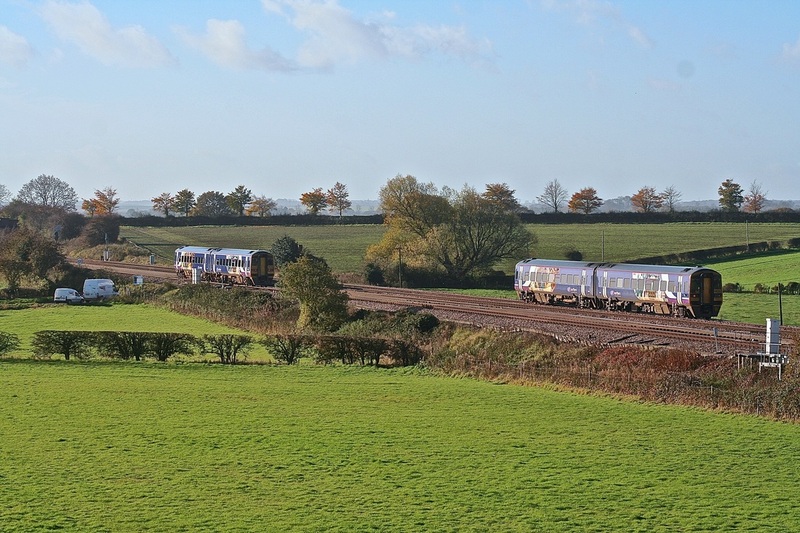 Hope, 23rd November 2014: Passing through non-stop at 75mph is 185139 with 1B80, the 13:55 Manchester Airport - Cleethorpes. Halifax, 9th July 2013: Departing with 2W66, the 08:50 Huddersfield - Leeds service, Northern Rail's 150112 passes the rather run-down signalbox, which controls the area between Mill Lane (Bradford) and Greetland. 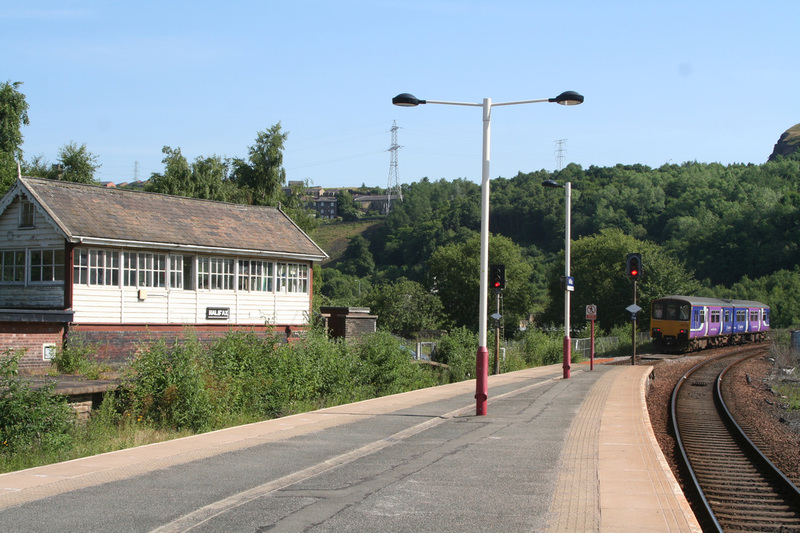 It is expected that Halifax signalbox will soon be closed and control of the area passed to Healey Mills PSB, following the closure of Greetland and Elland signalboxes in 2009. Toton TMD on 17th August 1976, or Swanwick Junction in 2013? 45108 rests between duties with an ex-Midland Railway water rusting away in the background. Holmes Junction (Rotherham), 26th September 2013: Causing extensive delays to both road and railway traffic, Devon & Cornwall Railways' 56311 cautiously reverses a long rake of engineers department bogie wagons into Booth's scrapyard, whilst 185119 waits for the shunt to clear with 1B77, the 11:26 Cleethorpes - Manchester Airport service. 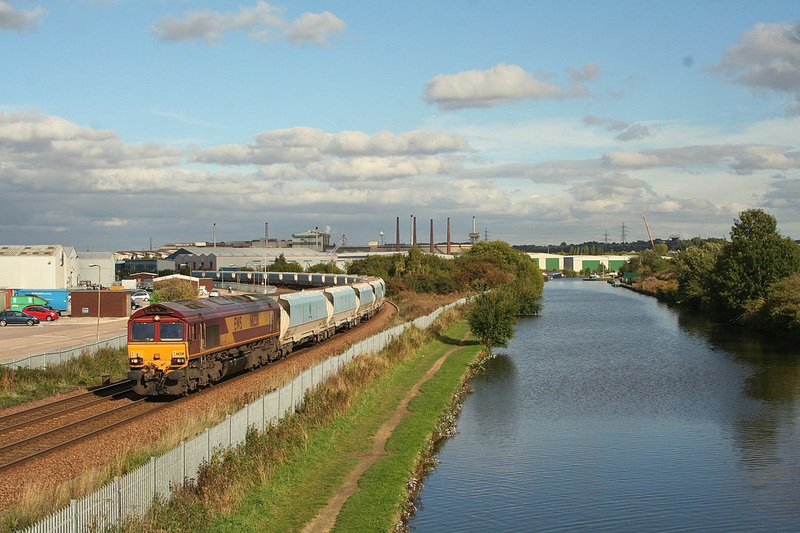 Parkgate (Rotherham), 8th October 2013: 66238 wheels 6H72, the 13:21 Milford West Sidings - Tunstead Sidings empty limestone train (formed of ex-National Power coal hoppers) round the back of the Parkgate Retail Park, running along the ex-Great Central line towards Rotherham Central, alongside the River Don. In the background is the large expanse of Aldwarke steelworks. Colton South Junction, 12th November 2013: Matching Northern Rail 158s, nos. 790 and 794, pass with 1B13 (08:11 Blackpool North - York) and 2R89 (11:02 York - Selby). 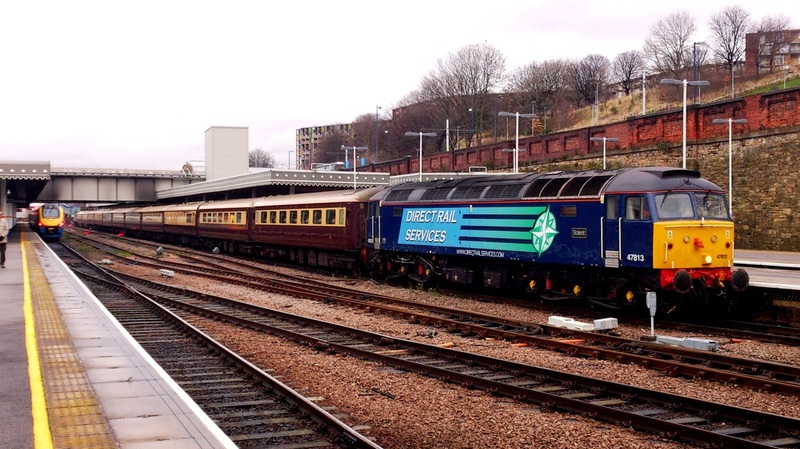 Both units carry vinyls advertising the Sheffield - Leeds express services via Barnsley. Wakefield Kirkgate, 23rd April 2014: Diverted from its normal route via Outwood due to overhead wire problems, 142092 passes slowly through on the centre road, heading for Wakefield Westgate with 2N13, the 06:43 Leeds - Sheffield via Moorthorpe. Retford, 15th May 2014: Arriving with the first northbound departure from London Kings Cross of the day, East Coast's 91116 leads 1S04, the 06:15 London Kings Cross - Edinburgh Waverly into the high-level platforms, whilst passengers await the arrival of 144007 with 2P56, the 07:00 Lincoln Central - Sheffield. 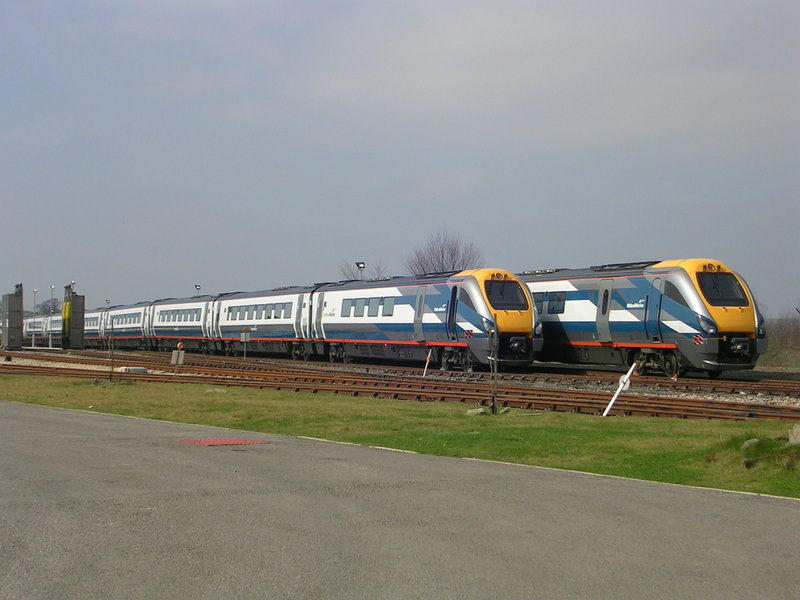 Crofton, 19th March 2005: Awaiting final entry into service for Midland Mainline, a pair of 9-car class 22 'Meridians' are seen stabled at the Bombardier depot. 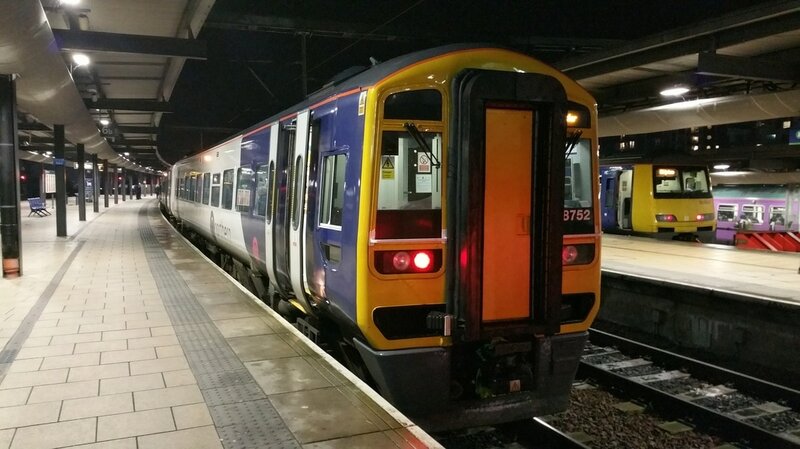 Since then, these units have been reduced to 7 cars, and whilst they still work Sheffield, Nottingham and Derby to London St Pancras services, they are now operated by East Midlands Trains. 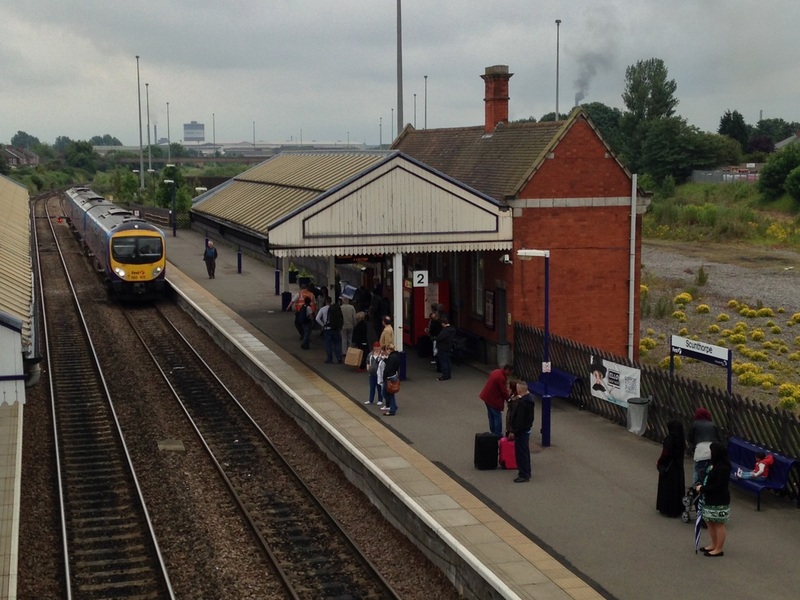 The depot, located on the outskirts of Wakefield, is still owned by Bombardier, and services First Trans-Pennine Express 170 'Turbostars' and Grand Central 180 'Adelantes'. 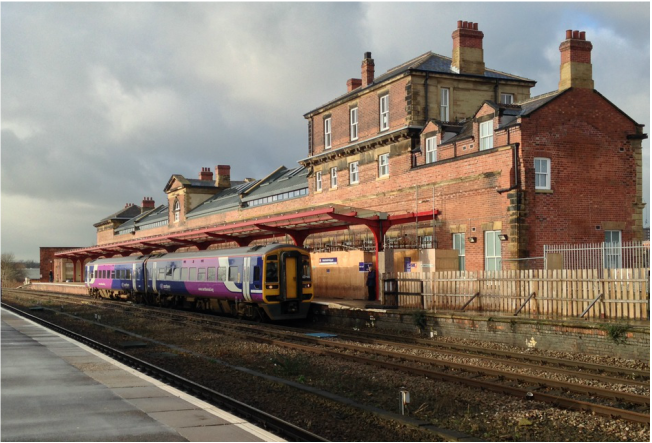 Wakefield Kirkgate, 16th January 2015: With work progressing on the renovation on the station building, 158790 calls with 1Y20, the 10:17 Nottingham - Leeds on a morning which had bright sunshine, strong winds and snow showers! 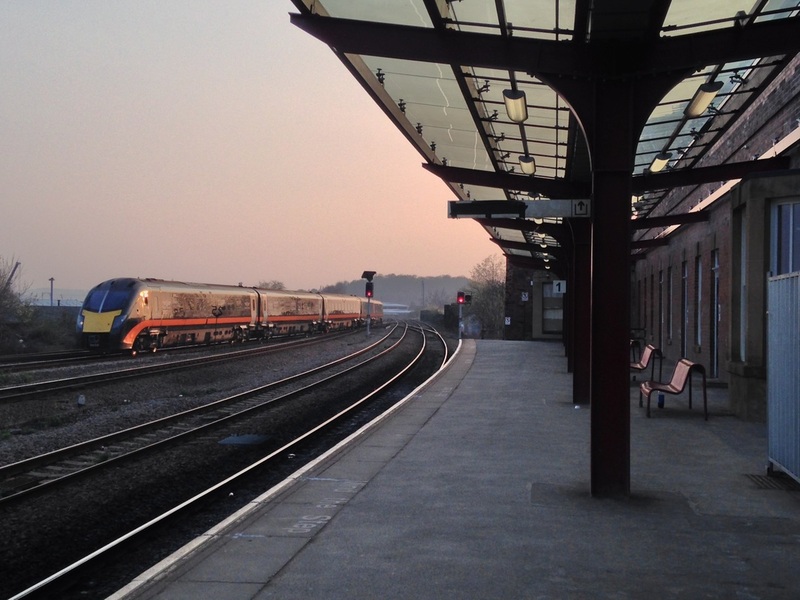 Wakefield Kirkgate, 9th April 2015: Having worked an out and back Bradford Interchange - London Kings Cross diagram, Grand Central 'Adelante' 180112 'James Herriot' trundles back to Crofton Depot in the evening sunset, empty stock. 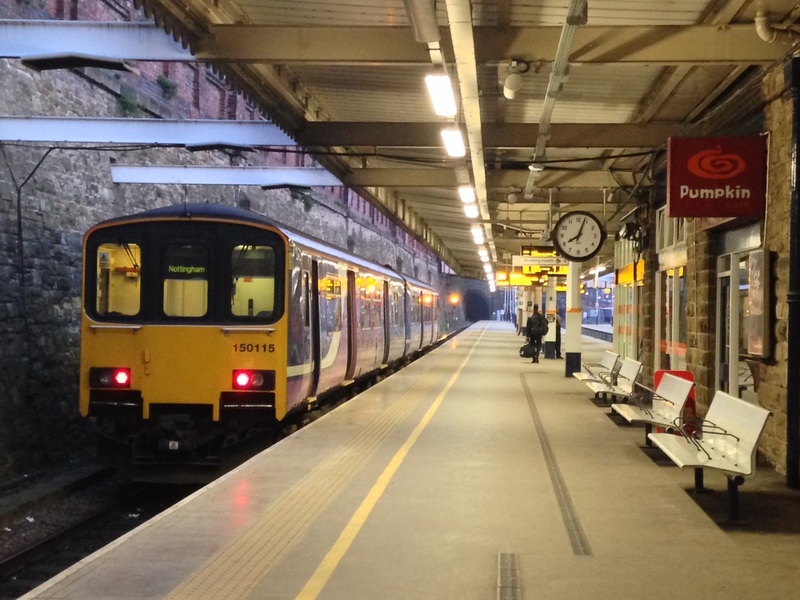 Sheffield, 9th April 2015: Covering for an unavailable 158, 150115 awaits departure with 1Y57, the 19:05 Leeds - Nottingham. 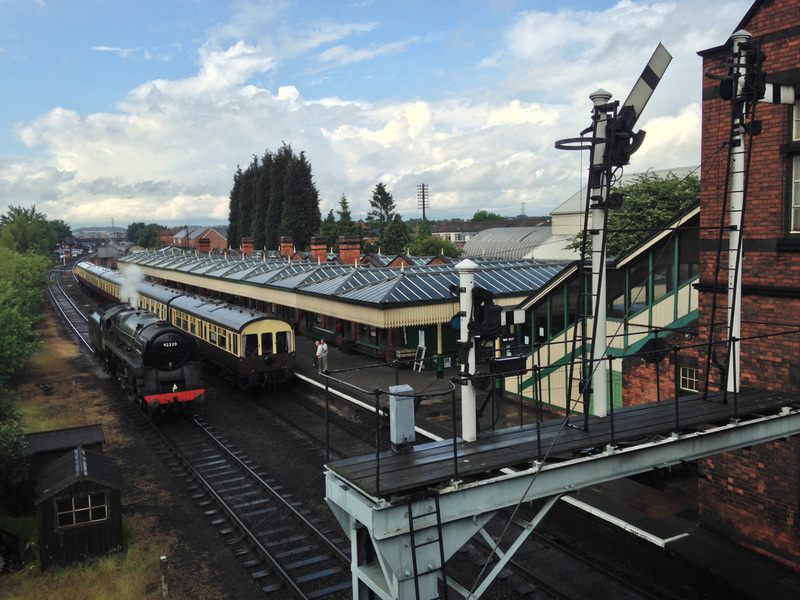 Loughborough, 20th June 2015: In a scene that could very well pass for 60 years previously, preserved BR-Standard 9F no. 92214 (running as classmate 92220 'Evening Star' - also preserved) runs round its train of Mk1 stock (out of sight), and passes another rake of Mk1s with an ex-GWR observation saloon at its rear. 92214 was one of two 9Fs running during the GCR Model event - other locomotives used during the weekend were 92212 and 'Flying Pig' 43106. 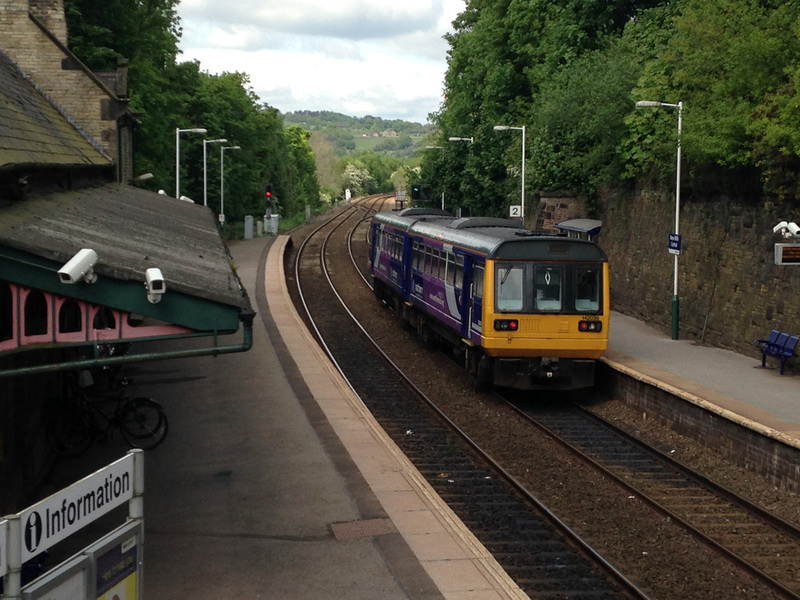 Grindleford, 31st May 2015: Departing into the distance with 2S33, the 12:14 Sheffield - Manchester Piccadilly is 142031. 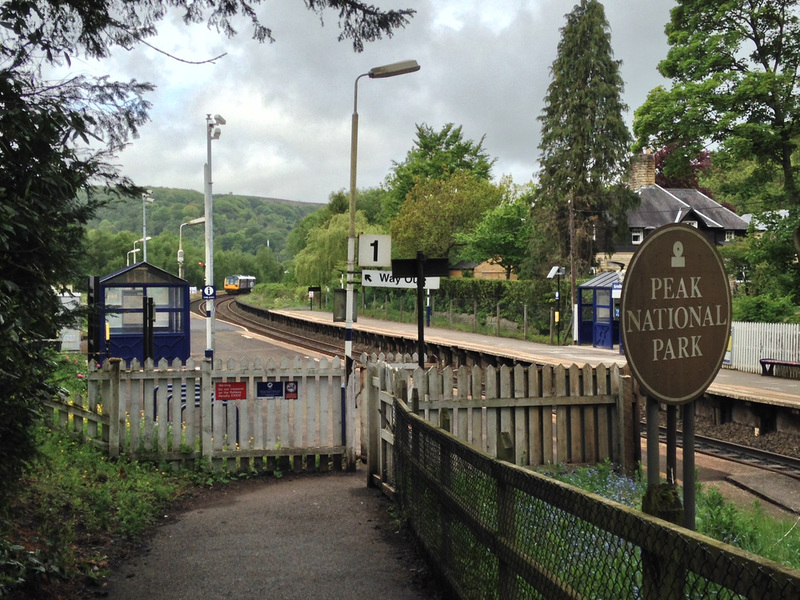 Located at the western bore of Totley Tunnel, Grindleford station is a 15 minute walk from the village, and like most stations on the Hope Valley line is popular with walkers. 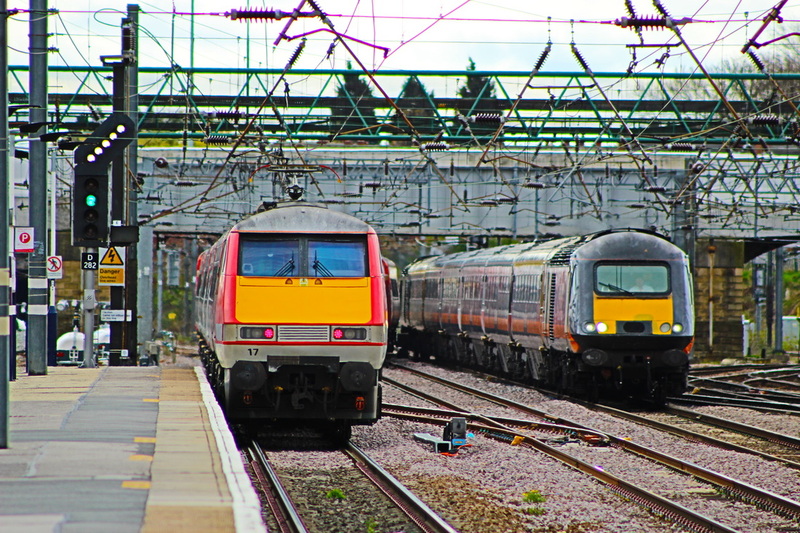 York, 24th April 2015: The driver of appropriately-named 91102 "City of York' will have to drive at more than 8-times this speed limit if he is to keep to schedule with 1S13, the 11:00 London Kings Cross - Edinburgh! 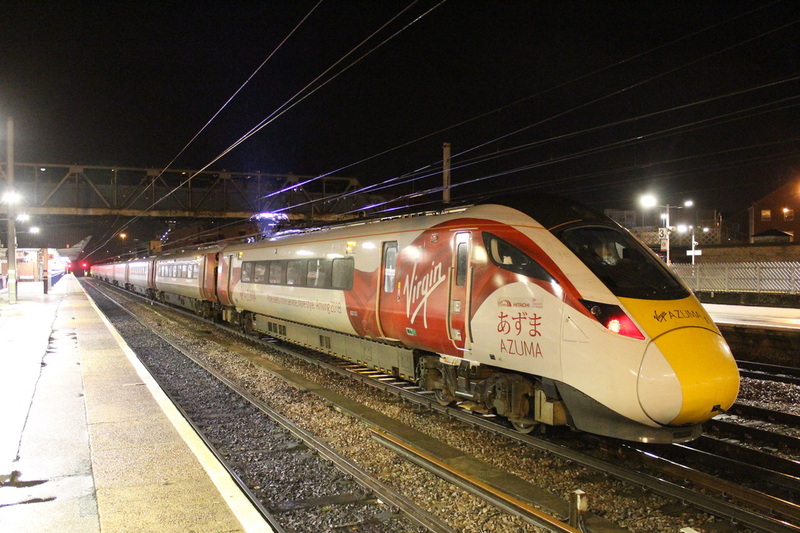 Whilst 91102 is still carrying East Coast grey livery, Virgin vinyls make it obvious that it is no-longer a government-run service, Virgin having taken over operations at the beginning of the month. Doncaster, 13th August 2011: The colourful side of Britain's railways: A total of 10 different liveries present in this picture, as No. 91118 in the old GNER blue livery leads an East Coast silver Mk4 set on the 09:30 London King's Cross - Edinburgh Waverly; Northern (blue)-liveried 158904 waits with the 10:41 Sheffield - Bridlington; Northern (West Yorkshire Metro)-liveried 321901 stands with the 11:26 to Leeds); an unidentified Arriva Cross-Country 220 waits at platform 8 with the 06:25 Bournemouth - Newcastle; Freightliner's 66598 draws an empty coal train past on one of the freight-loops, EWS-liveried 67003 stands in the West-Yard on 'Thunderbird' duties, and to complete the picture, Network-Rail and Railtrack hoppers stand outside the works, along with ex-Virgin Mk3 coaches. If one were to look in the works' yard, another 6 liveries could be identified on stock: Merseyrail, GNER (red stripe) NXEA (Undercoat), Wrexham & Shropshire, Euro-Tunnel, and Watbec's blue livery! Peak Forest, 27th June 2011: No. 67019 prepares to leave light engine from Peak Forest for the Manchester area while 60071 'Ribblehead Viaduct' arrives from Toton with a lunchtime engine movement. 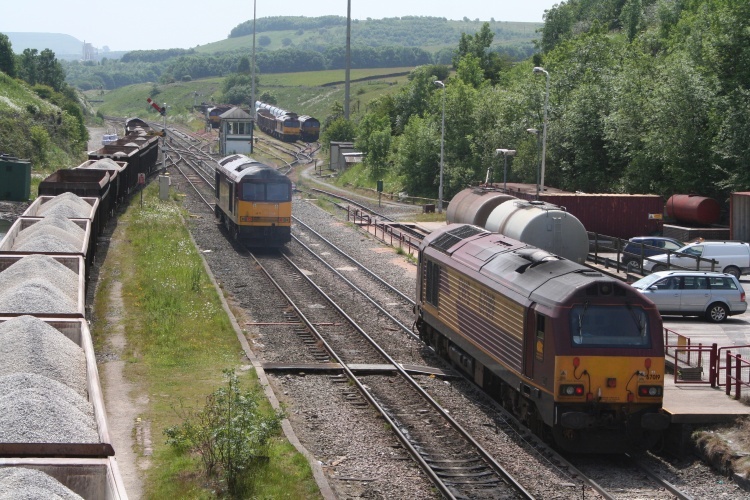 Stabled in the sidings were 60096, 66035 and 66078, while 66011 stood at the head of the loaded stone hoppers on the right. 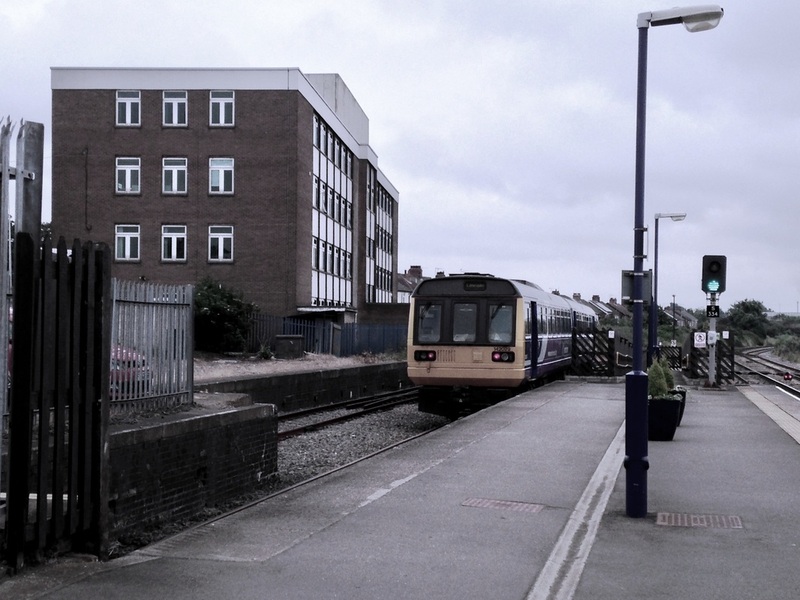 Norman's Bank, 27th June 2011: Northern Rail's No. 142014 ambles through the Hope Valley near Edale working the 14:14 Sheffield - Manchester Piccadilly all-stations service, headcode 2S41. Bawtry, 25th June 2011: East Coast's No. 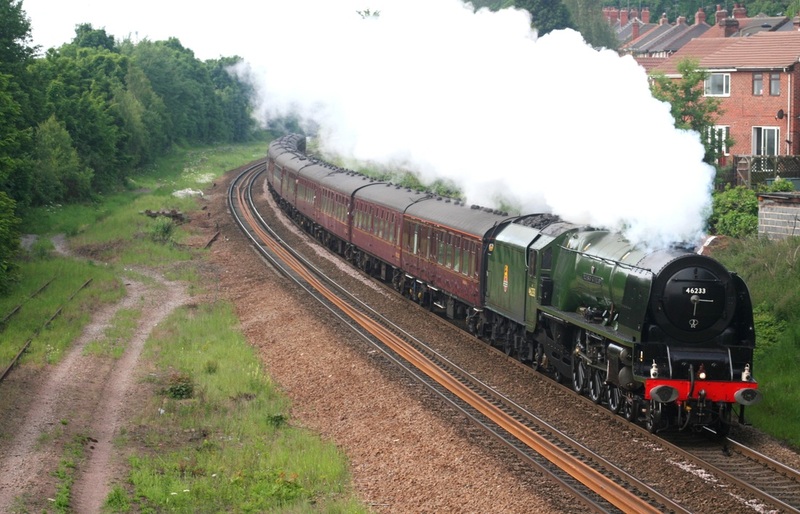 43238 brings up the rear of the down 'Highland Chieftain' as it passes over Bawtry viaduct, south of Doncaster, behind 43307. Trains today pass over this rather shallow, but long viaduct across marshland at over 100mph, where as until at least the 1960s there was a severe speed restriction of 40mph or less over the viaduct. 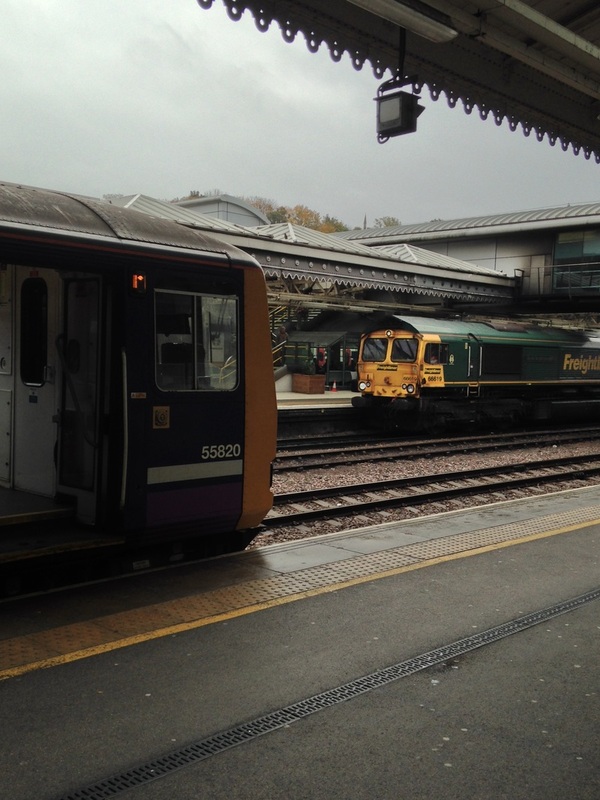 Sheffield, 29th October 2015: Northern Rail's 144020 awaits departure from platform 1B with 2B44, the 11:36 service to Huddersfield, whilst a rather battered Freightliner 66619 passes with a Hope - West Burton Power Station cement train. York, 27th October 2015: Preserved ex-LMS 'Jubilee' no. 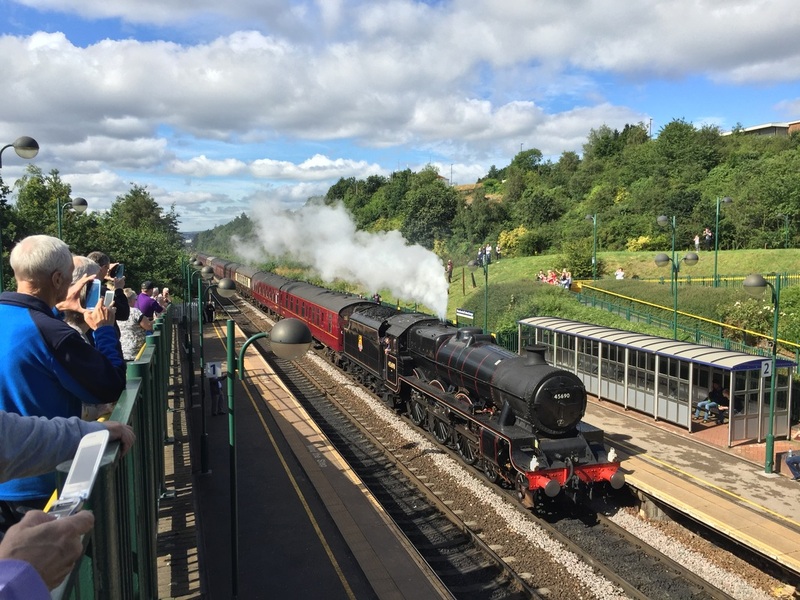 45699 'Galatea' puts on an impressive steam show whilst setting down passengers on the return-leg of the Scarborough Spa Express. 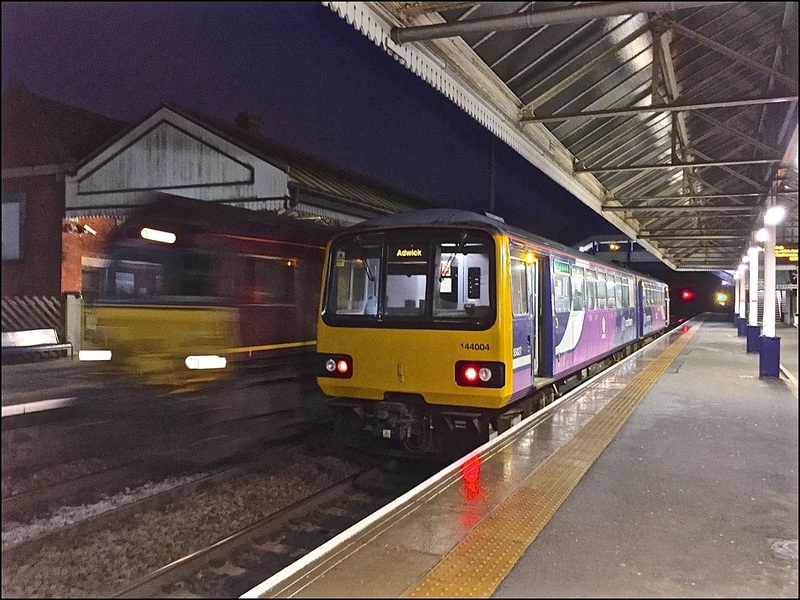 Barton-on-Humber, 1st December 2015: Northern Rail's 153324 awaits departure with the 11:55 departure for Cleethorpes. A short distance from the southern end of the Humber Bridge, this branch-line terminus is something of a time-warp - the end of a line that you would expect to have been closed by Dr Beeching! 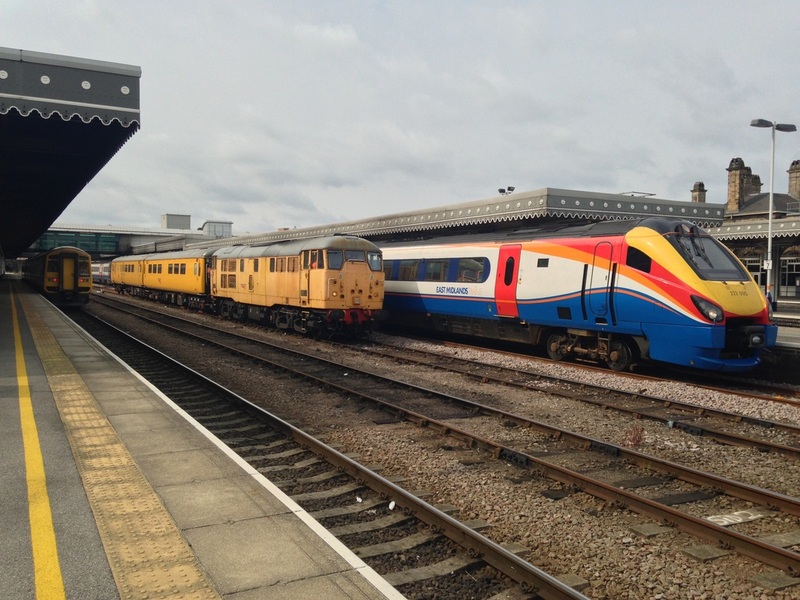 At the end of this month, the mechanical signalling on the branch became the sole remaining examples in the area - the mainline being resignalled with control passing to York ROC, and the Northern units will be replaced with East Midlands Trains units during 2018. Scunthorpe, 22nd January 2016: Northern Rail's 144004 awaits departure with the first stopping train of the day, the 07:24 to Adwick via Doncaster, whilst an unidentified DB-Schenker 66 (still carrying the defunct EWS livery, despite the company ceasing to exist nearly 10 years ago!) passes wrong-line with a light engine movement. Doncaster, 26th January 2016: A convoy of Colas Rail co-co locomotives, headed by BR (Crewe)-built 47739 'Robin of Templecombe', slows for a signal stop. 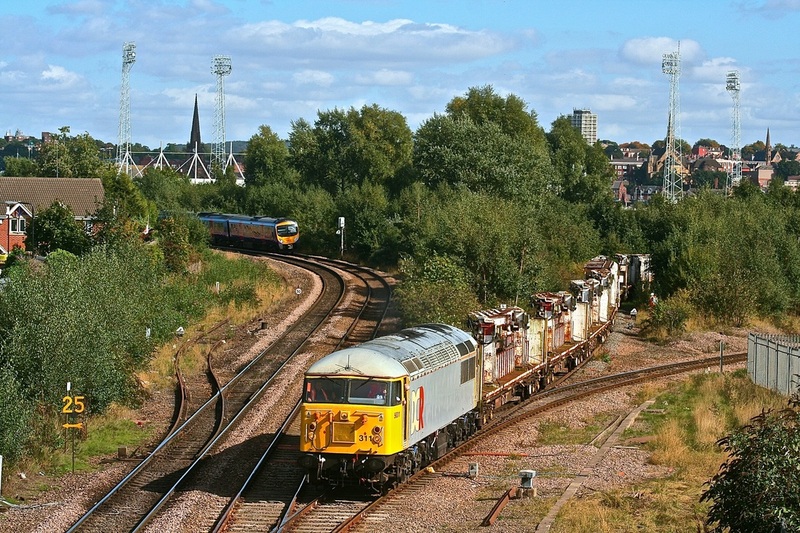 The other two locos in the Birmingham-bound consist are EMD (Canada) built 66/8s, with 66849 'Wylam Dilly' in the middle. 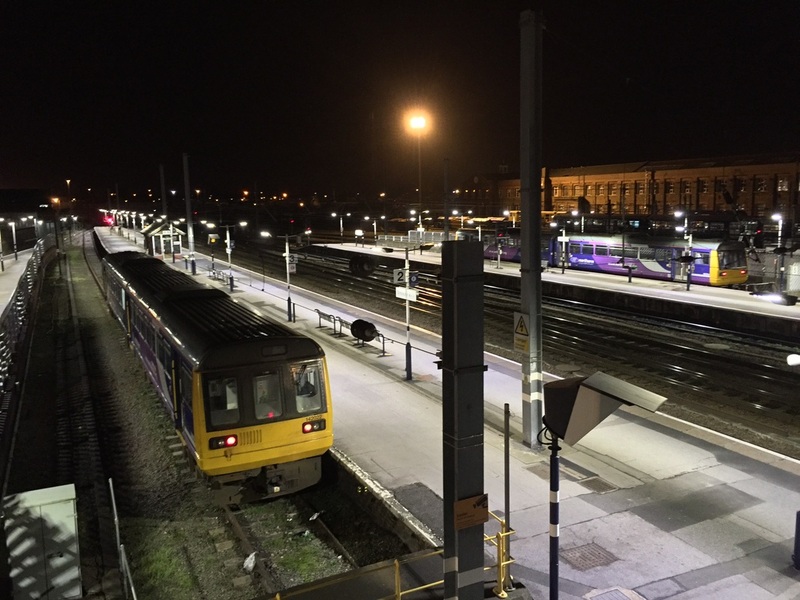 Doncaster, 30th January 2016: Shortly after midnight, Northern Rail's 142s nos. 022 and 096 have a well-earned overnight rest in the south-facing bays, before commencing further 18-hour diagrams the next day. 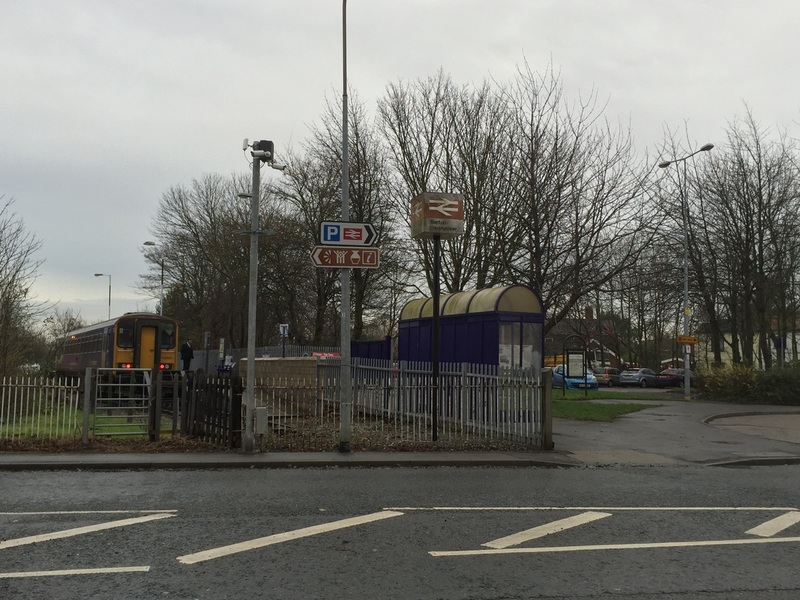 Rotherham Central, 1st February 2016: Two products of the British Rail era, the double-arrow logo of the 1960s and 142015 of 1986, pose at the recently-refurbished station. Whilst the double-arrow has become an instantly recognisable marker for railways, the 142 has not aged quite so well and will be removed from service within the next 5 years. 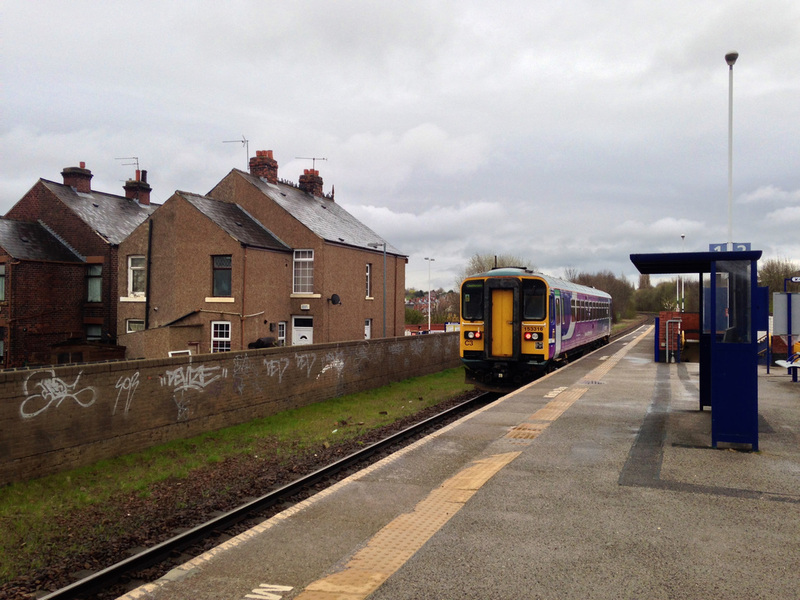 Mexborough, 10th January 2016: One of Northern Rail's 3-car 144s, no. 020, pauses with the 20:15 Doncaster - Sheffield stopping service. 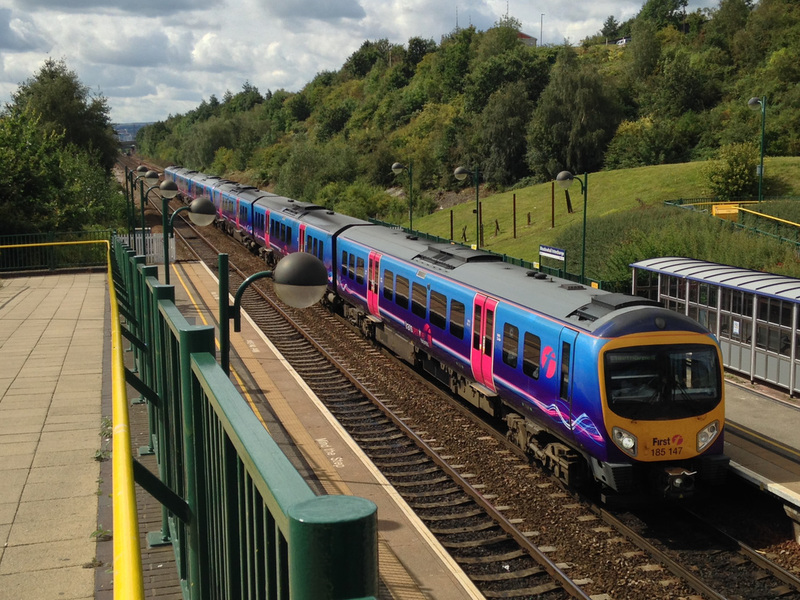 The use of 3-car 144s in the Doncaster area only normally occurs on Sundays - 2-car 142s and 144s being the norm, with the 3-car 144s being concentrated on the Barnsley/ Dearne Valley, Knottingley, Harrogate and Huddersfield lines on weekdays. Doncaster, 4th February 2016: Whilst Northern Rail's 158855 lays over in the south-end sidings before working back to Hull with the 13:52 stopping service, DB Schenker's 90036 'Driver Jack Mills' and 90018 'The Pride of Bellshill' pass with the 13:30 Doncaster Down Decoy - Tyne Yard engineers (formed of just 3 high-seed IOA ballast wagons). 90s are not normally seen on the ECML, except on charters, but with the WCML taking a battering from the winter storms, the overnight sleepers are being diverted, hence the daytime appearances to maintain driver route knowledge. 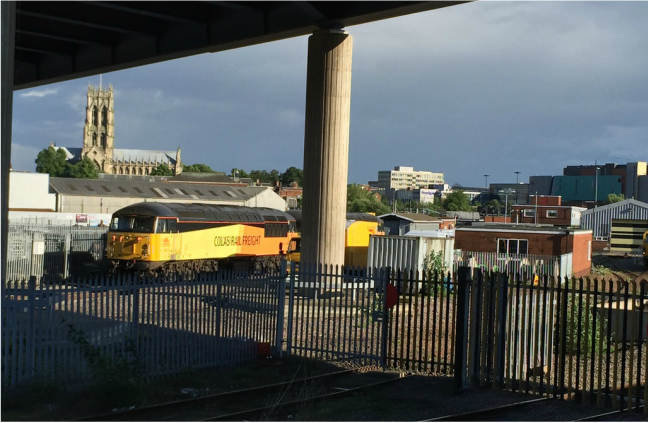 Doncaster, 29th June 2016: Stabled in the engineers' depot at Marshgate Junction is Colas Rail's 56113, along with an unidentified class mate. 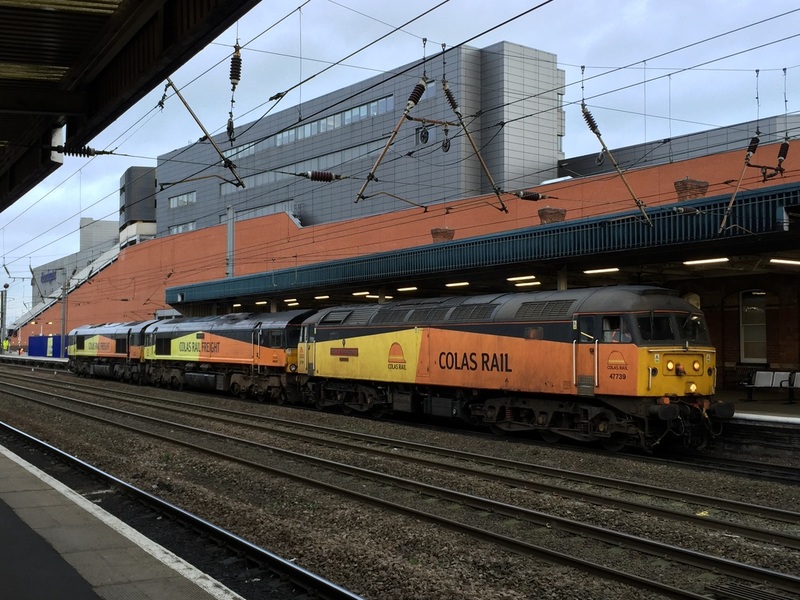 Usually home to a variety of track machines, in recent times Colas locomotives ranging from 47s to 56s, 60s and 70s have stabled here between working engineers' trains. 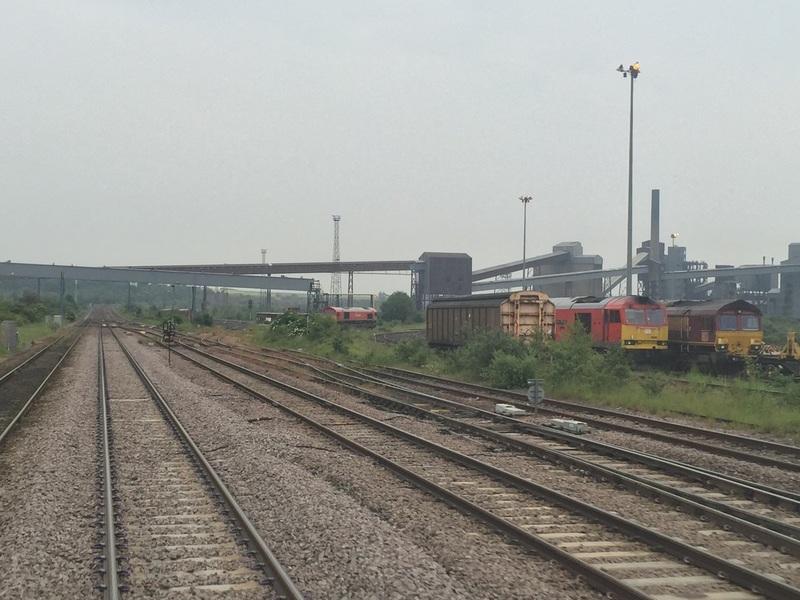 Scunthorpe, 10th June 2016: Viewed from the back cab of 153352, 66152, 60091 and 66172 are stabled in the sidings adjacent to Scunthorpe Trent Jn, along with several redundant wagons, including a VGA 4-wheeled van. The backdrop is the massive site of the steelworks, recently brought back into British ownership, following a period under the control of the Indian group TATA. Gilberdyke, 25th June 2016: An unidentified Northern 150/2 heads for York with 2R06, the 12:04 departure from Hull. 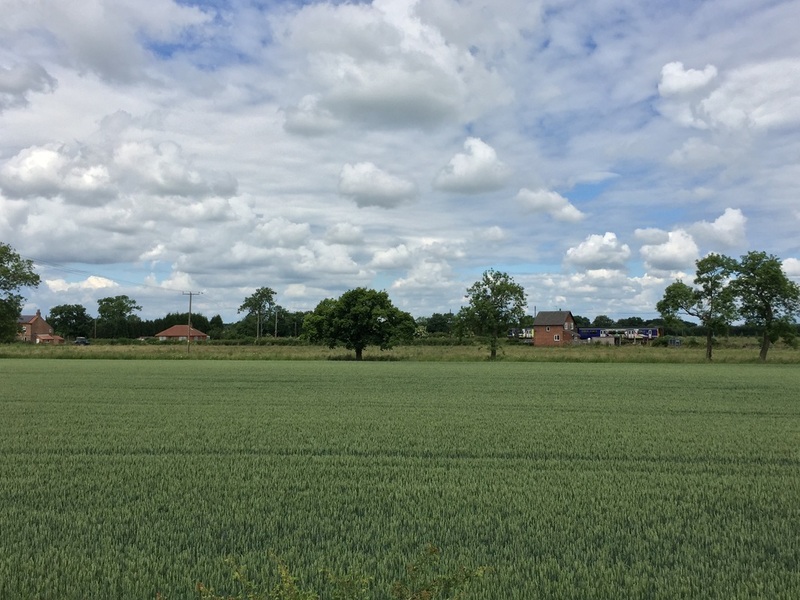 The rural nature and large, flat landmass of the area is quite apparent. The signalbox here is one of a diminishing number to still control semaphore signals. 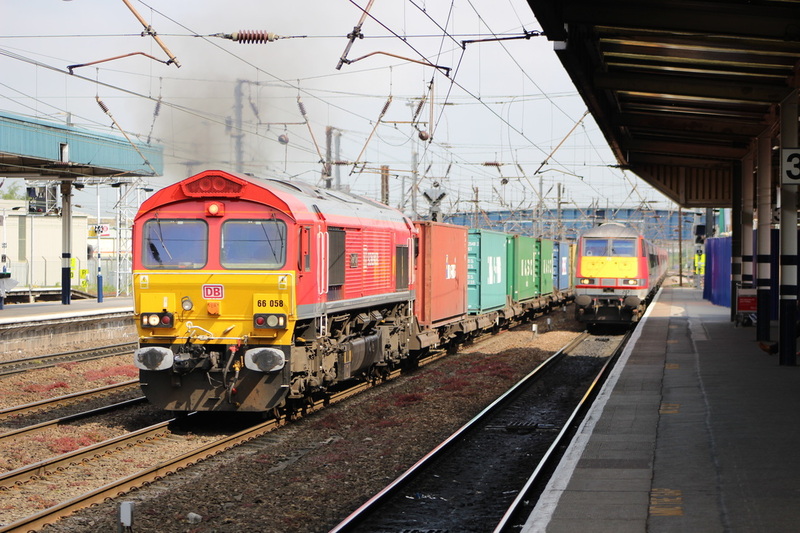 Doncaster, 9th June 2016: Putting the power down with a heavy and well-loaded freightliner from Wakefield to Felixstowe is DB Schenker's 66058, whilst arriving alongside on platform 3 is an East Coast Mk4 set on 1Y82, the 10:04 York - London Kings Cross. Leeds, 25th February 2016: Leaving the metropolis behind is Northern Rail's 158755 with 2M12, the 13:18 Leeds - Manchester Victoria stopping service via Bradford Interchange and the Calder Valley. 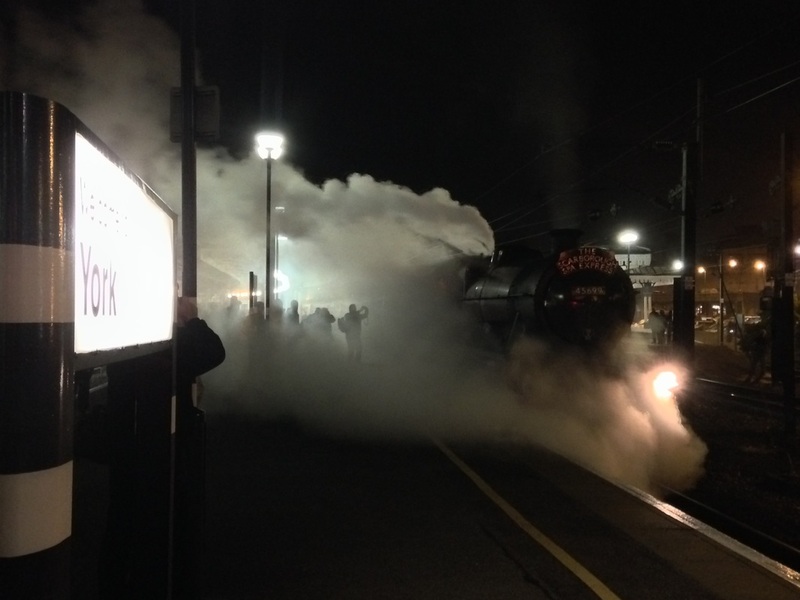 Elsewhere on the network, people were flocking to the East Coast Mainline to witness the return to service of probably the most famous train of all: 60103, 'Flying Scotsman'. 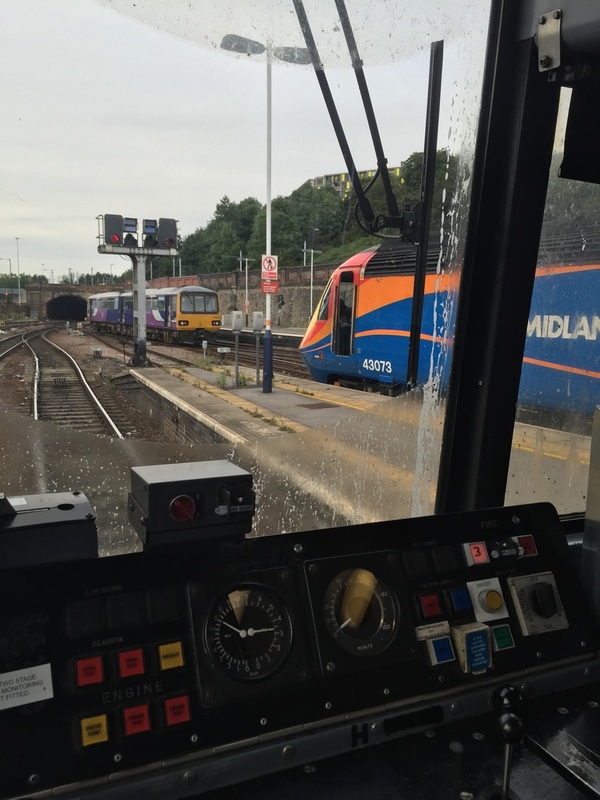 Picture taken from the rear cab of 2B17, the 13:21 Leeds - Doncaster, worked by 322484. 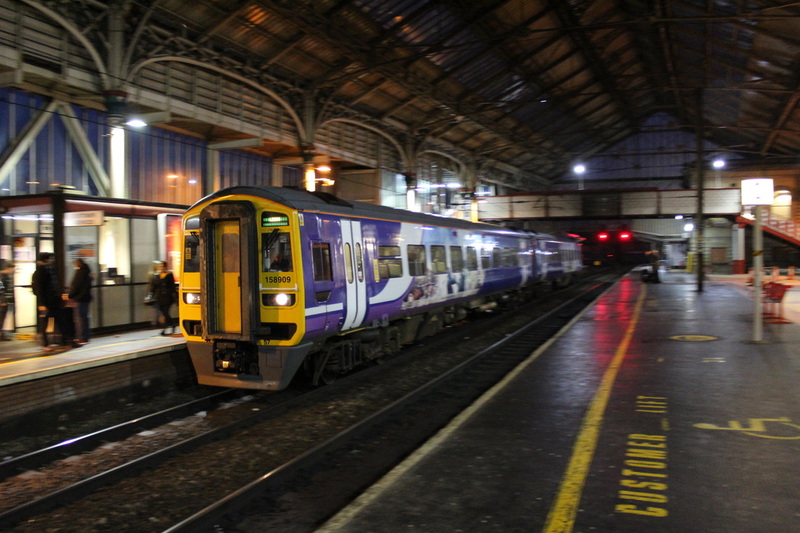 Preston, 8th March 2016: Already shorn of its 'Northern Rail' branding in readiness for the start of the new franchise at the end of the month, 158909 arrives with 1B33, the 18:11 Blackpool North - Leeds service. Having been operated by Serco and Abellio as a joint-venture since 2004, the Northern franchise passed back to Arriva on 1st April 2016. 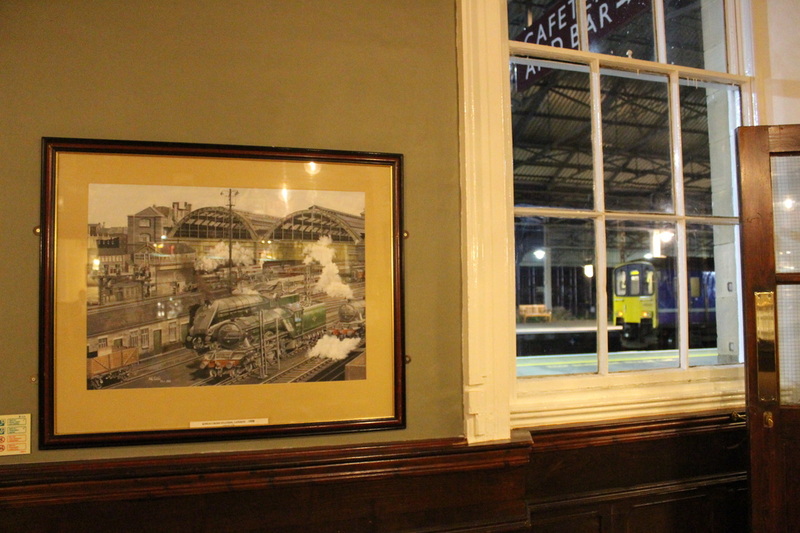 Huddersfield, 8th March 2016: Viewed through the windows of the 'Head of Steam' pub on Huddersfield station is Northern Rail's 150143, waiting its 21:15 departure time to Manchester Victoria. The painting is of London Kings Cross, circa 1958 by A.E Giles. 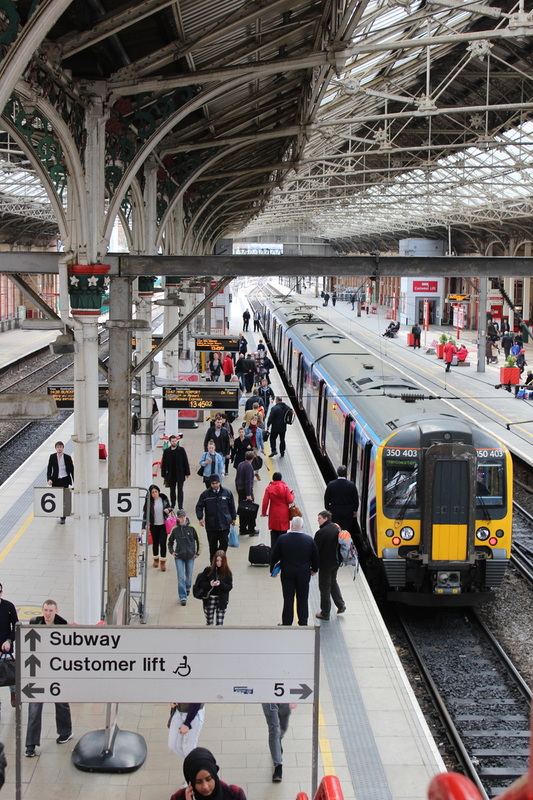 Preston, 15th March 2016: Passengers alight from First Trans-Pennine Express' 350403, working 1M96, the 11:09 Glasgow Central - Manchester Airport. 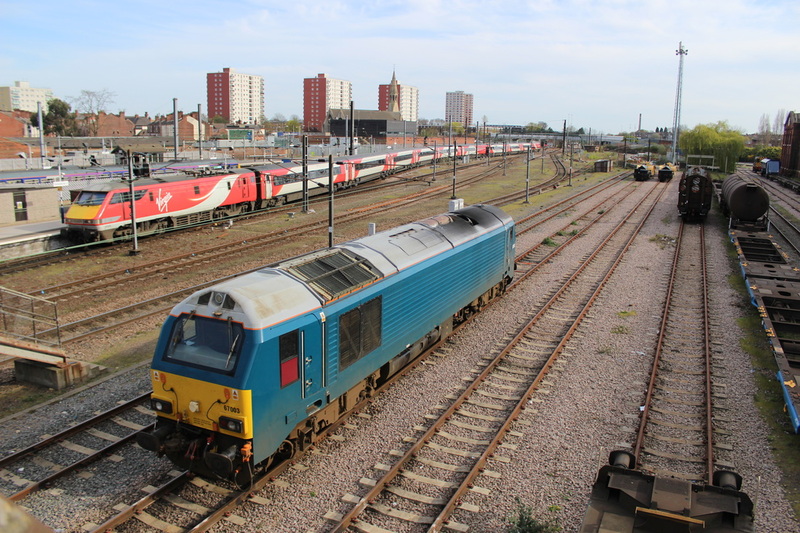 Doncaster, 21st April 2016: Well away from its intended Arriva Trains Wales duties, DB Schenker's 67003 is on 'Thunderbird' duties, as Virgin Trains East Coast's 91124 arrives with 1D20, the 15:35 London Kings Cross - Leeds. Doncaster, 29th April 2016: Two generations of East Coast Main Line express traction, still hard at work. 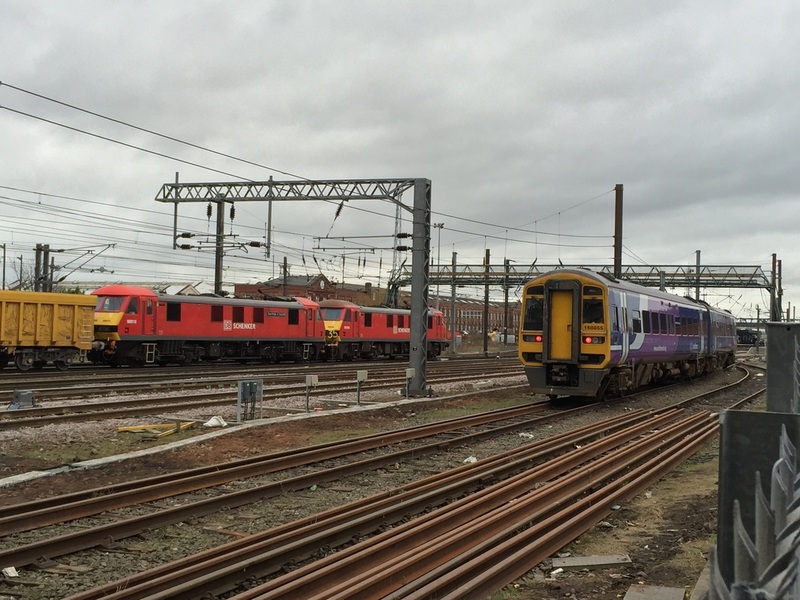 Virgin Trains East Coast's 91117 propels 1E10, the 10:00 Edinburgh Waverly - London Kings Cross onto its next stop at Newark Northgate, whilst Grand Central's 43480 powers northwards with 43423 on 1N92, the 11:21 London Kings Cross - Sunderland. Thorne Junction, 16th August 2016: Despite EWS being taken over nearly 10 years ago by DB Schenker, 66057 still wears its obsolete livery, worn since delivery. 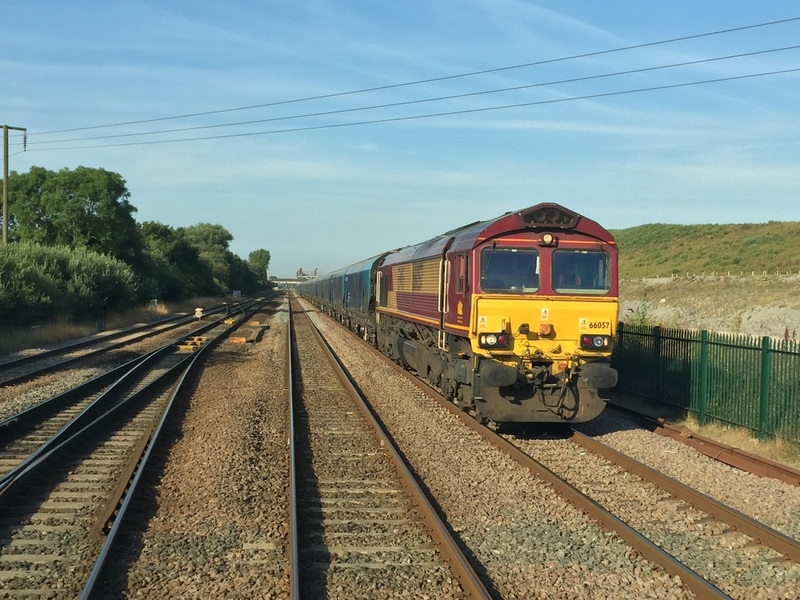 It is working one of the many biomass circuits, with high capacity bogie hoppers, running from Drax Power Station to Immingham Docks. Picture was taken from the back cab of 2R25, the 07:24 Sheffield to Scunthorpe, worked by 142079. Sheffield, 31st July 2016: Viewed from the cab of 144022 which had just terminated with 2R15, the 18:18 from Doncaster, 144007 departs from one of the Up Station Sidings whilst performing a shunt. Meanwhile, East Midlands Trains' 43073 has just arrived with 1F49, the 15:40 from London St Pancras, and will trail the 19:28 departure back to the Capital. Meadowhall Interchange, 30th July 2016: Working a Liverpool Lime Street - Scarborough railtour, preserved ex-LMS 'Jubilee' no. 45699 'Galatea' accelerates away from a water-stop past a mobile phone wielding crowd. The loco is wearing a non-prototypical livery; whilst some wore black in war-time LMS-days, they were painted in Brunswick green in BR days. 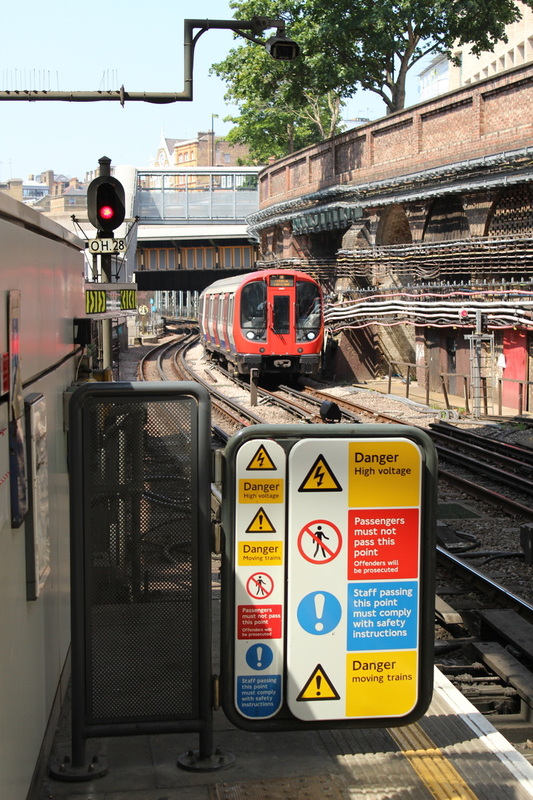 Farringdon, 20th July 2016: A location much changed since the 1970s, both in terms of traction and structure, the investment in Central London is readily apparent as an S7-set arrives with a clockwise Circle-line service. Whilst the area is now much more vibrant and cleaner than it was 30-40 years ago, the amount of line-side cabling hasn't reduced! London Marylebone, 20th July 2016: It is hard to believe that what was once the 'forgotten' London terminus is now a vibrant and prosperous station. 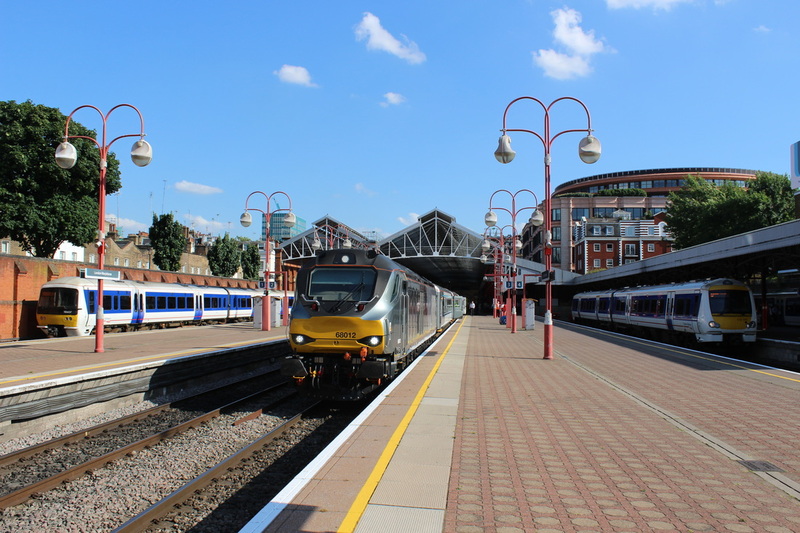 Very much run down during the 1960s and 1970s, Marylebone was threatened with closure in the mid-1980s, but was rejuvenated after the onset of Network SouthEast, and is now the London hub of Chiltern Railways. During the evening rush-hour, 68012 is flanked by 165037 and 172101. The 68 is hauling the only rake of slam-door Mk3s used by Chiltern, the other rakes having been modified with power-operated plug doors. Warrington Bank Quay, 12th August 2016: A backdrop that HASN'T changed much over the past 30 years! 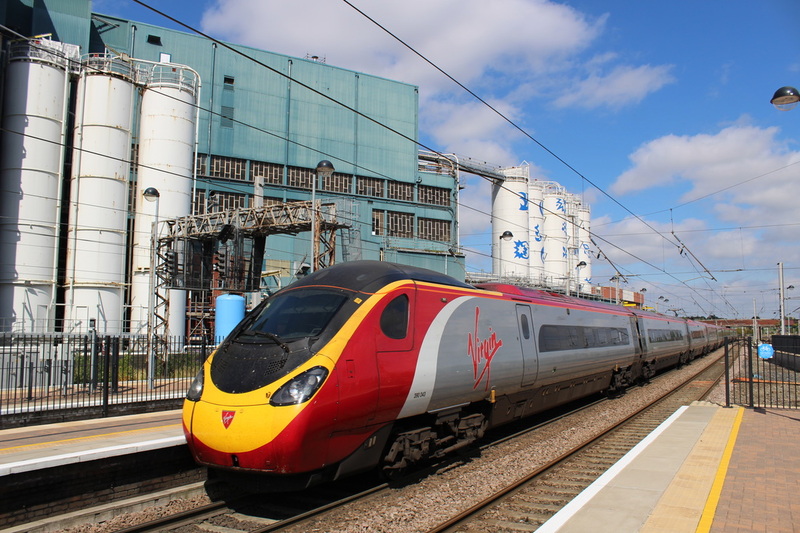 The Unilever Detergent plant which overlooks the WCML station towers over Virgin Trains Pendolino 390043, which is departing with a London Euston - Glasgow Central service. Buxton, 12th August 2016: The attractive ex-L&Y/Midland station in Buxton plays host to 150119, awaiting departure with a service to Blackpool North. 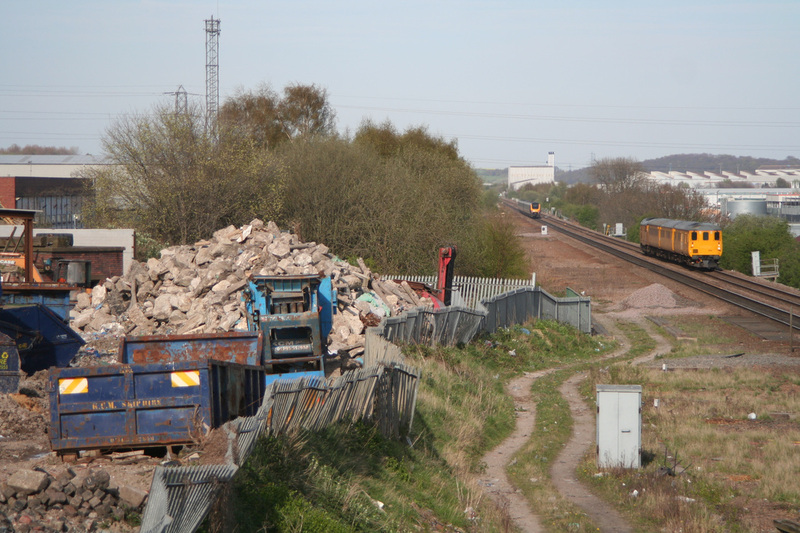 Besides having a locomotive depot (behind the photographer on the right side), the station used to have services to Millers Dale and Derby via ex-Midland Railway rails, but that half of the station was demolished in the 1960s - the ex-L&Y line to Hazel Grove remaining open . Doncaster, 19th August 2016: The Great British Summer! West Coast's 47851 brings up the rear of 5Z67, a Carnforth - Norwich empty stock movement, in readiness for a tour to Plymouth the following day. 47854 'Diamond Jubilee' provided front-end traction. 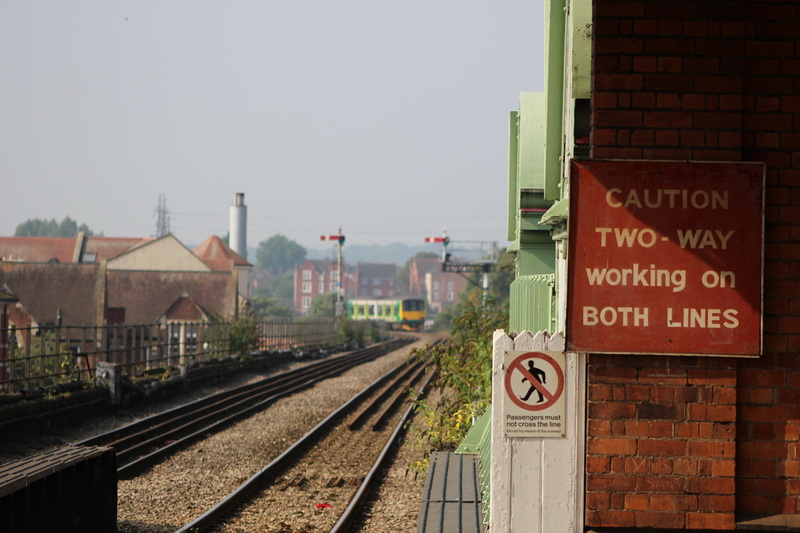 Worcester Foregate Street, 14th September 2016: The railways in the Worcester area are a hotbed of antiquated railway infrastructure, including semaphore signalling, ex-GWR benches, and old signage, including this bi-directional working warning sign. Receding in the background is London Midland's 150/1 no. 150103, working 1V25, the 10:49 Birmingham New Street - Hereford. 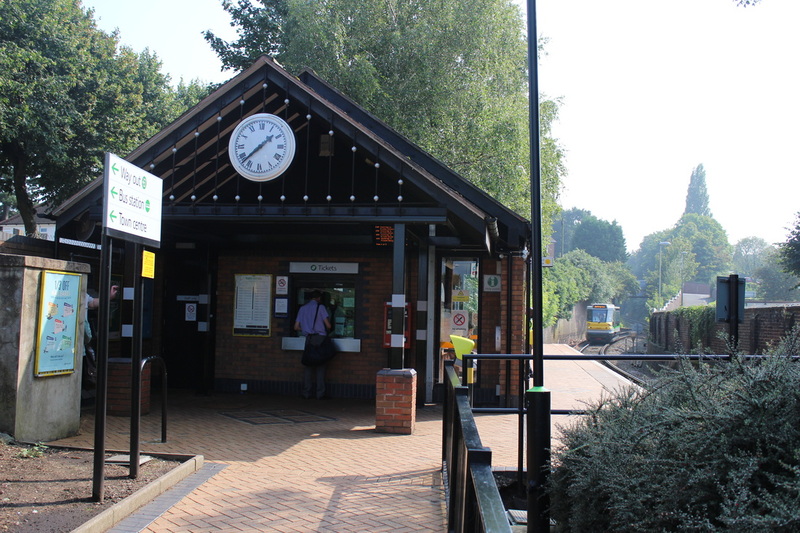 Stourbridge Town, 14th September 2016: A unique operation within the UK is the Stourbridge branch. Just 0.8 miles long, it is now operated using 2 Parry People Mover light rail vehicles, with each round trip taking less than 10 minutes! Maximum permitted speed on the jointed track line is just 20mph - although you wouldn't want to go any quicker given the PPM's riding characteristics! Approaching the relocated station dating from 1979 is 139001 with the 13:35 from Stourbridge Junction. Birmingham Moor Street, 14th September 2016: Departing from the wonderfully restored station past a former water-tower is 172334 with 2S48, the 13:57 Stourbridge Junction - Stratford-Upon-Avon. 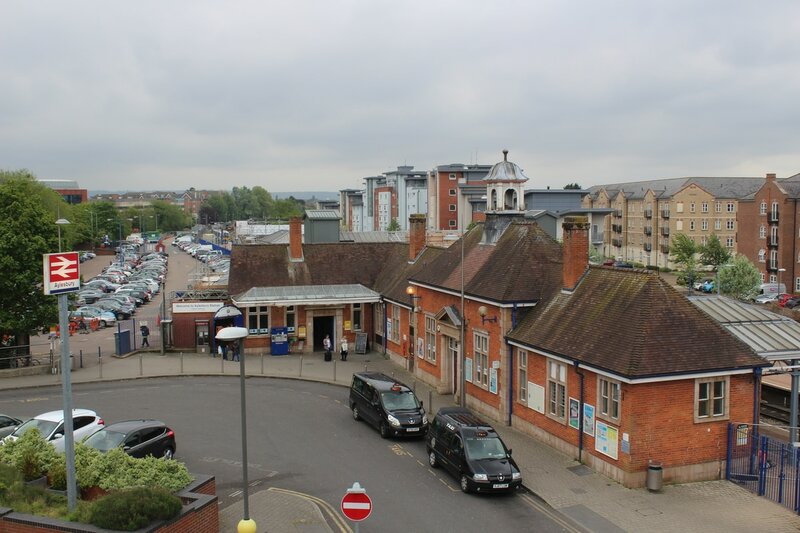 It is hard to believe that back in the early 1970s the station was almost derelict and had an infrequent peak-only service - now it is a vibrant, bustling station with multiple and varied workings per hour, including loco-hauled services to London Marylebone. Tyseley, 14th September 2016: Passing the carriage wash for the DMU depot, Chiltern Railways' 68011 hauls the late-running 1R33 13:10 London Marylebone - Birmingham Moor Street service along the last few miles of its journey. The simplified junction layout is far removed from the myriad of junctions that would have existed here in the steam era. 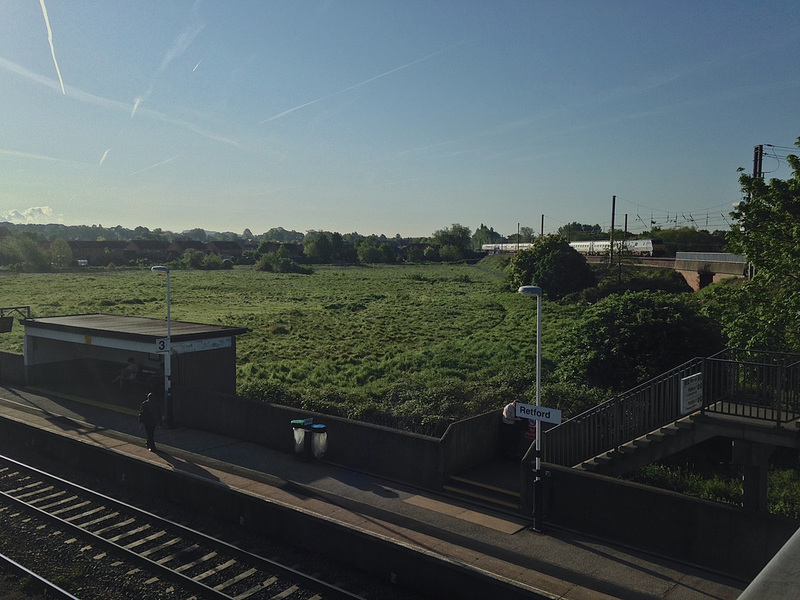 Tyseley, 14th September 2016: Largely untouched since the 1960s (save for some new signage), Tyseley station has the ambience of a forgotten backwater. 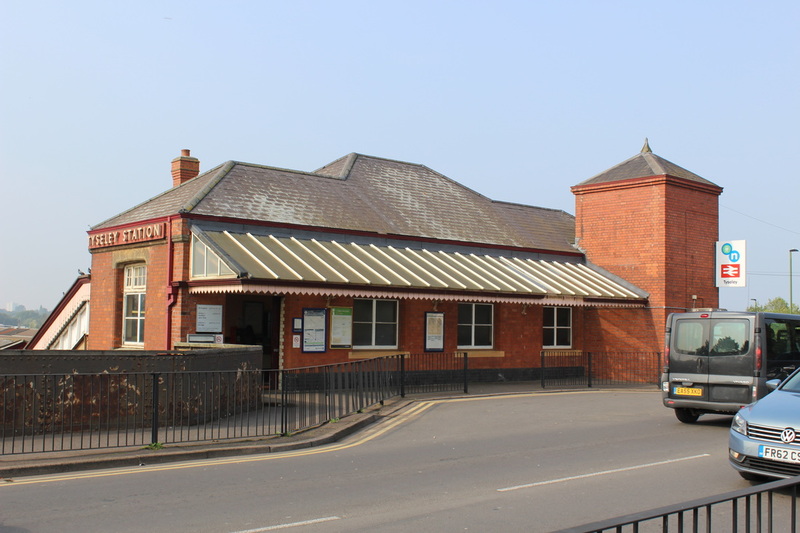 Situated in a largely industrial area of southern Birmingham, and adjacent to a large DMU depot and the heritage centre, the station still retains this nice road-level building (complete with BR nameboard), and the platform buildings still stand. However, it is unstaffed, the buildings are empty, and generally starting to look in need of renovation. 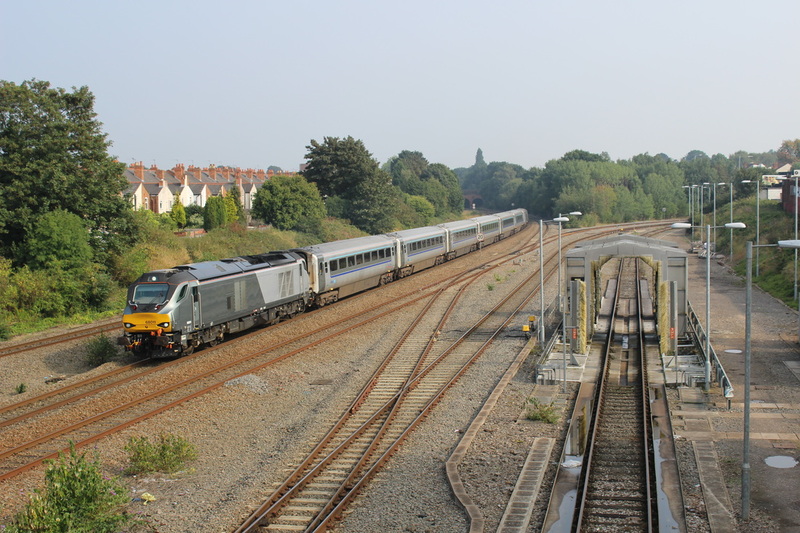 Leamington Spa, 14th September 2016: Arriving with 1G43, the 15:40 London Marylebone - Birmingham Snow Hill is Chiltern Railways' 168215. 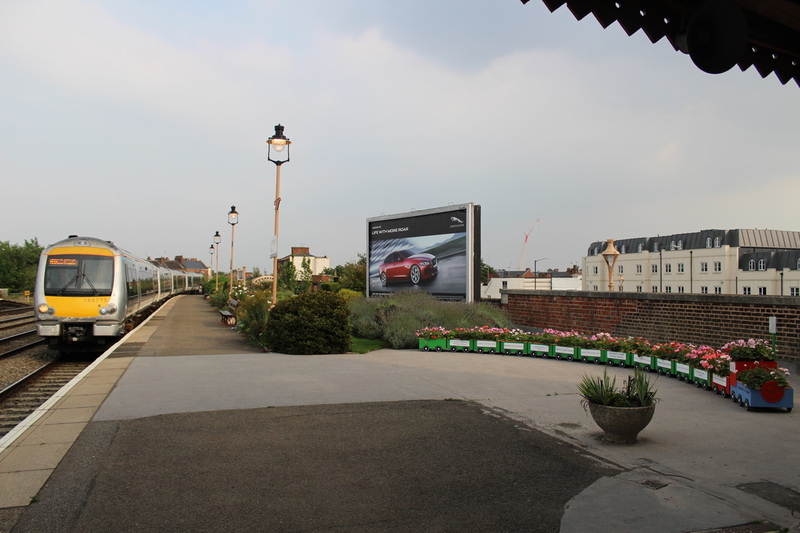 Of note is the beautiful garden display, complete with heritage GWR benches, lights and running-in station nameboards, and the community schools-sponsored garden train. 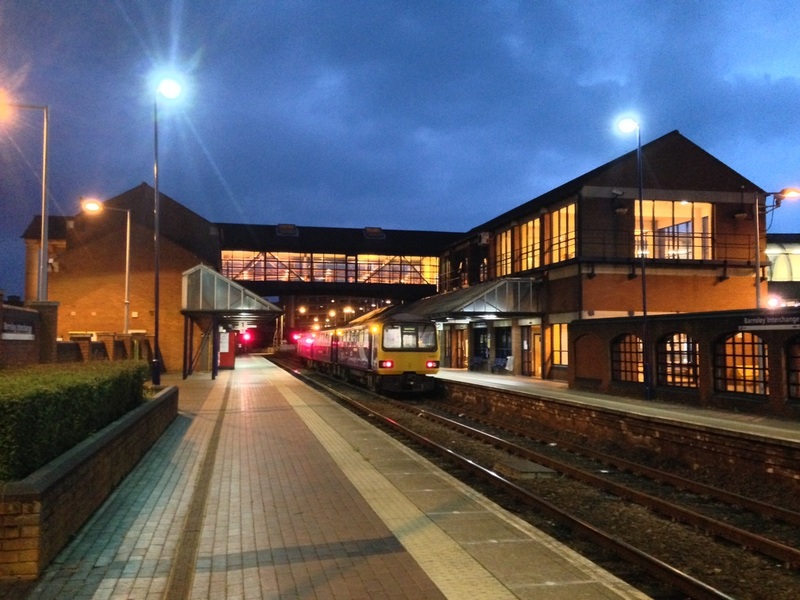 Leamington Spa, 14th September 2016: Another view of the delightfully-restored station, with GWR benches, lamps and signage finished in the traditional chocolate and cream colour scheme. 168215 awaits departure with 1G43, the 15:40 from London Marylebone to Birmingham Snow Hill. 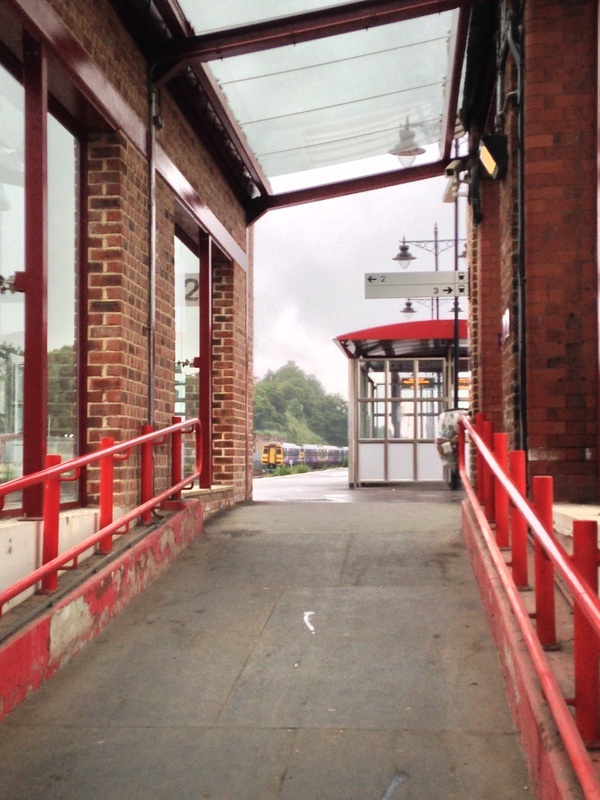 The station building is finished in an art-deco style, completing the 1930s atmosphere. 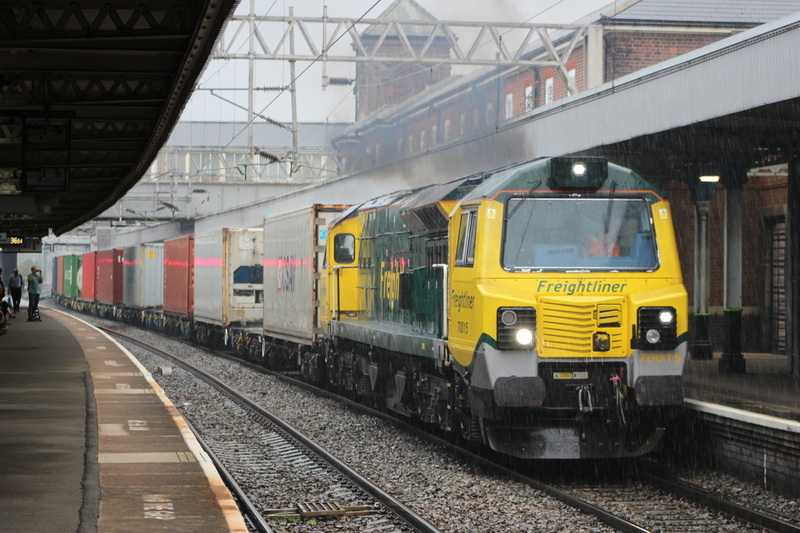 Nuneaton, 14th September 2016: Powering away from a crew-change during a heavy downpour, Freightliner's 70015 works hard to get a well-laden Southampton MCT - Garston FLT container service on the move again. Manchester Piccadilly, 20th September 2016: Arriving at platform 13 with 1H88, the 12:53 Llandudno Junction - Manchester Airport service is Arriva Trains Wales' 175116. The scale of the engineering on the main station's terminal platforms adjacent is quite apparent from this perspective. 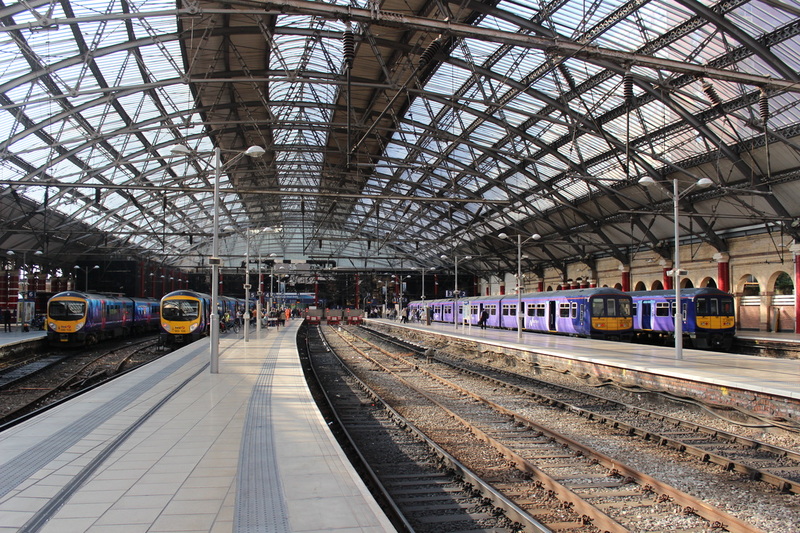 Liverpool Lime Street, 20th September 2016: Awaiting departures from the grand terminal station are (L-R) First Trans-Pennine Express' 185102 and 185126, and Northern's 319374 and 319379. Since the demise of loco-hauled west coast services, multiple units are normally the only traction here - as such the centre stabling sidings are falling into disuse (the one between platforms 5 and 6 is now disconnected). 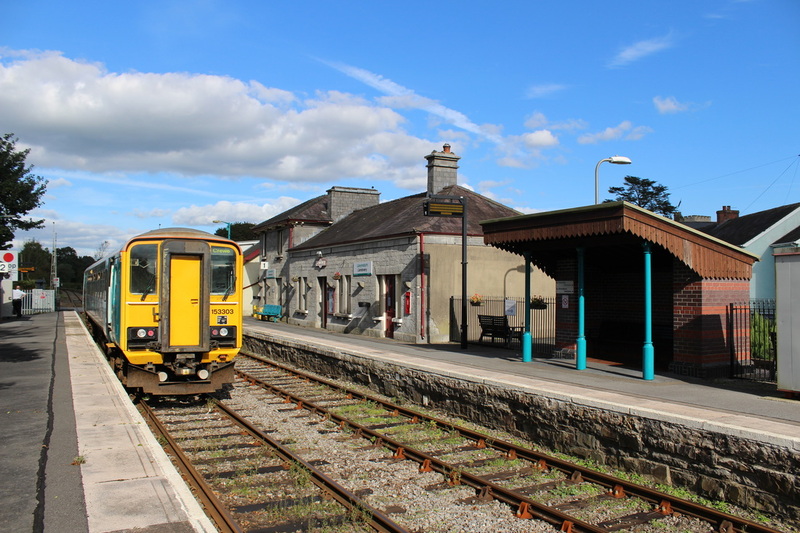 Llandovery, 22nd September 2016: Far removed from the hustle and bustle of city life, Arriva Trains Wales' 153303 waits whilst the crew obtain the single line token for 2M10, the 14:35 Swansea - Crewe service at the nice and tidy station. Llanwrtyd Wells, 22nd September 2016: Displaying different Arriva liveries, 153s nos. 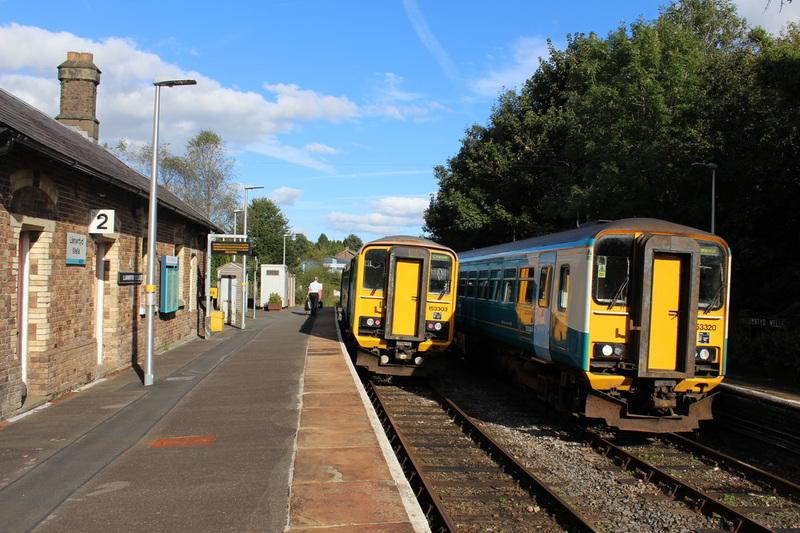 303 (in the new 2-tone turquoise livery) and 320 (in the obsolete turquoise and cream livery) cross whilst working 2M10 (14:35 Swansea - Crewe) and 2V10 (14:05 Shrewsbury - Swansea). 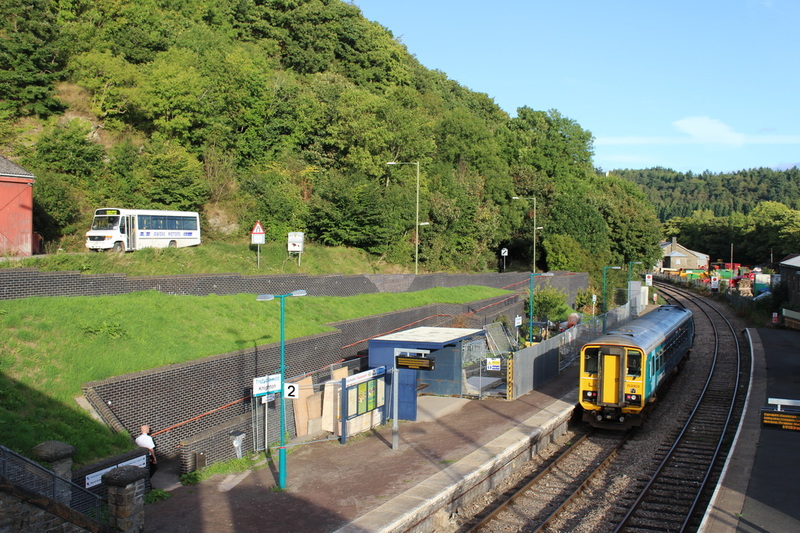 These services also swapped crews here - each taking just over 4 hours to complete the 121 mile journey with 31 stops. 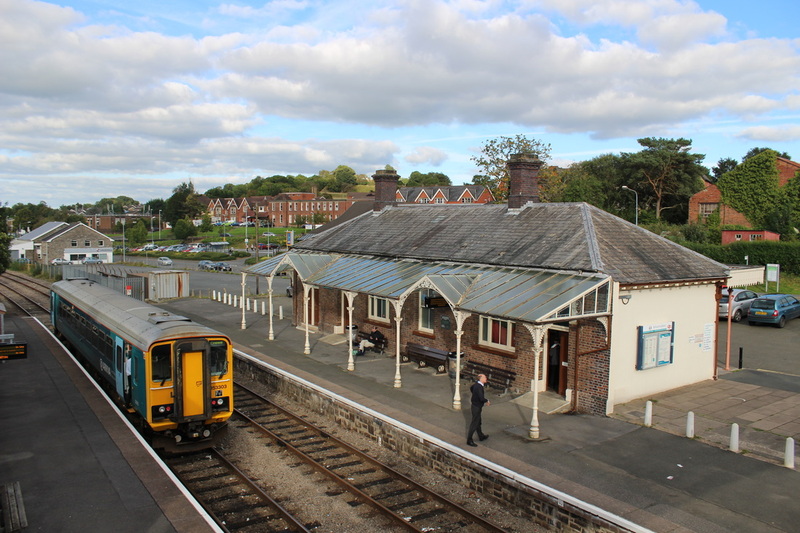 Llandrindod Wells, 22nd September 2016: Waiting time at the picturesque and nicely restored station is 153303, again with 2M10 (14:35 Swansea - Crewe). 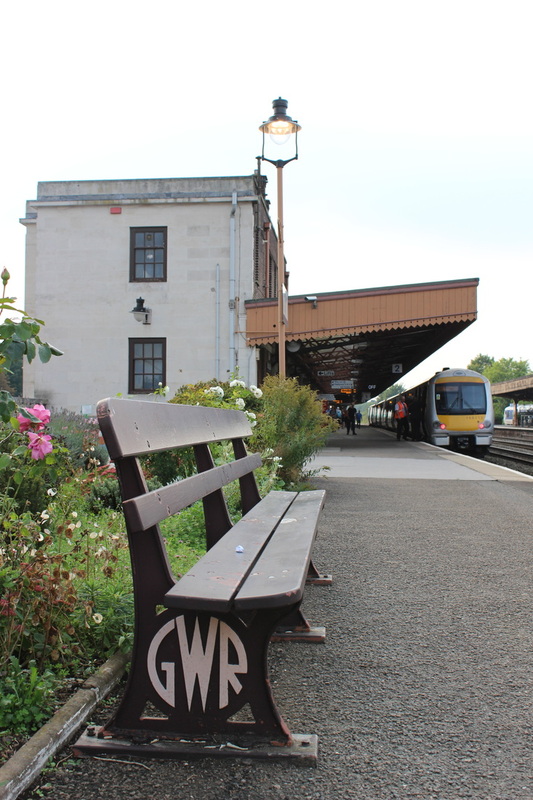 The station features GWR benches and woodwork finished in western region chocolate and cream, and a restored signal box at the southern end of the southbound platform. Knighton, 22nd September 2016: Yet another view of 153303 with 2M10 - comparisons with the Plaxton Beaver bodied Mercedes bus from a local operator are easy to make! 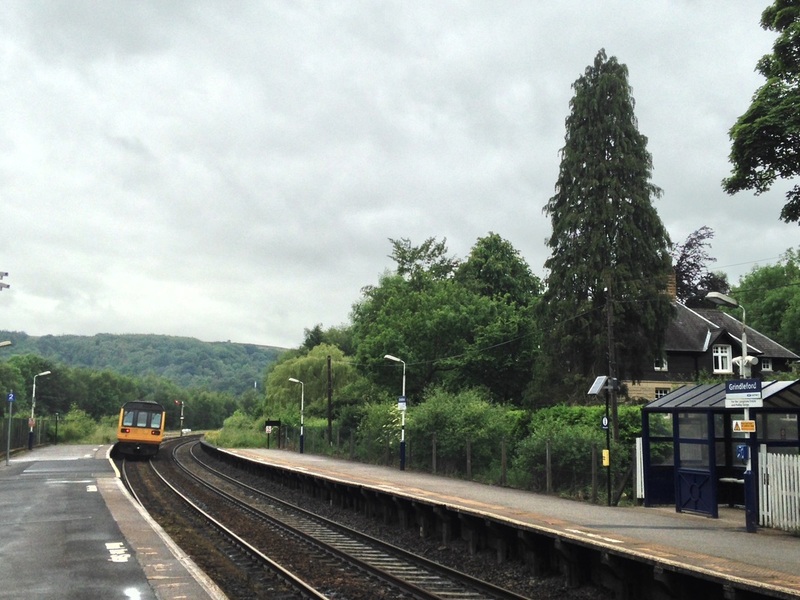 The tranquil wayside station is actually in a different country to the market town it serves - the station being in Shropshire, England, and the town being in Powys, Wales! 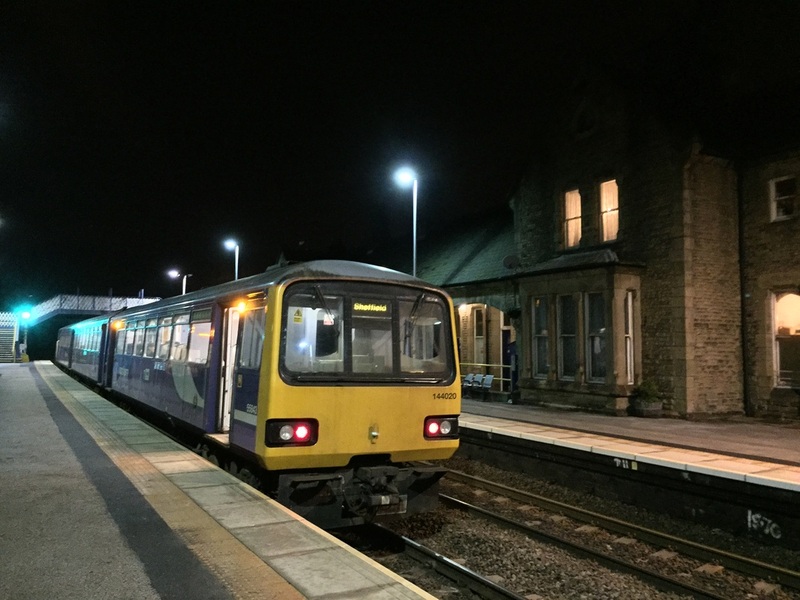 Settle, 11th October 2016: Departing from the smartly presented station of Settle with 2H86 (the 10:49 Leeds - Armathwaite) is Northern's 158795. 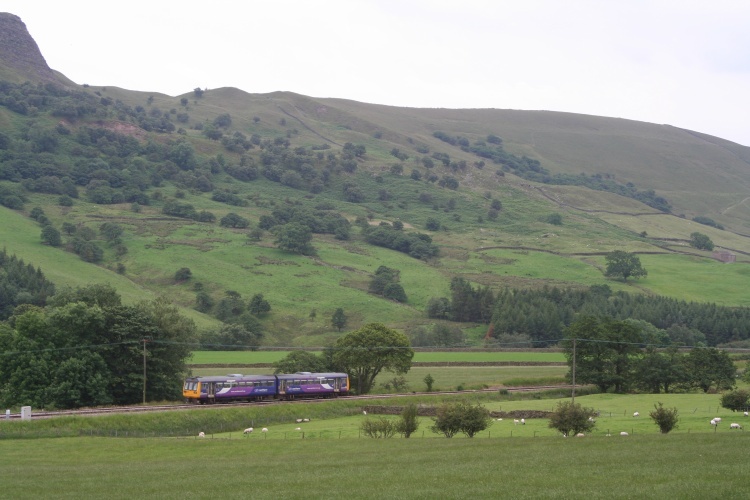 Services are not expected to run through to Carlisle until March 2017 due to the Eden Brows landslip of February 2016. Doncaster, 13th October 2016: The Future... Brand-new 9-car class 800 Bi-Mode IEP no. 800101 pauses on the Down Fast shortly after 5am with 5X01, a 2am move from Stevenage to Merchant Park Sidings, Darlington. These units will not be introduced to service until 2018, with the trains currently being built at Hitachi's new plant at Newton Aycliffe. 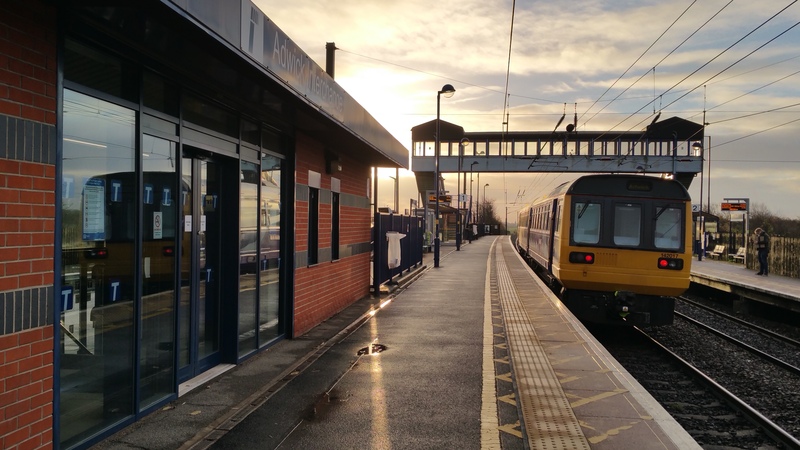 Adwick-le-Street, 28th November 2016: Awaiting departure with the 08:33 to Doncaster is 142017. The weak winter sun can give different lighting perspectives - the subject of illumination something some modellers may overlook. 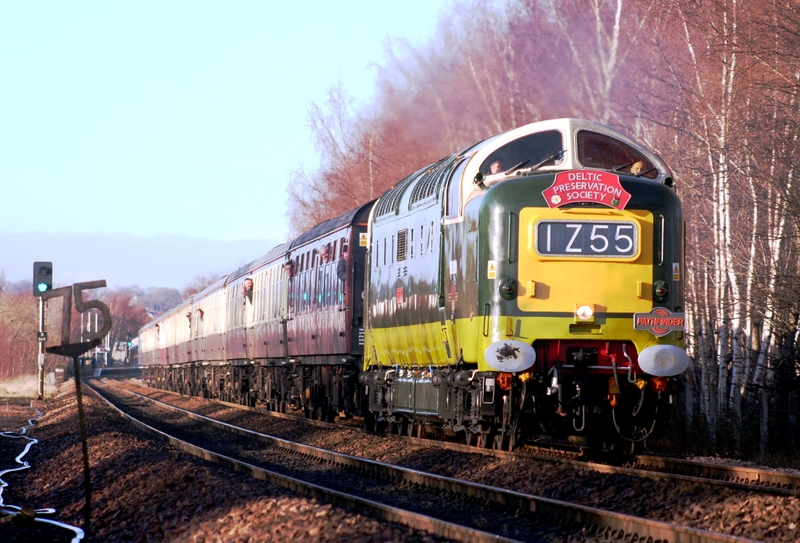 Mexborough, 28th December 2013: Passing the now-closed Ferryboat Lane foot crossing is preserved 'Deltic' D9009 'Alycidon' with the 'Winter Settler' railtour from Crewe to Carlisle via Derby, Sheffield and Doncaster. 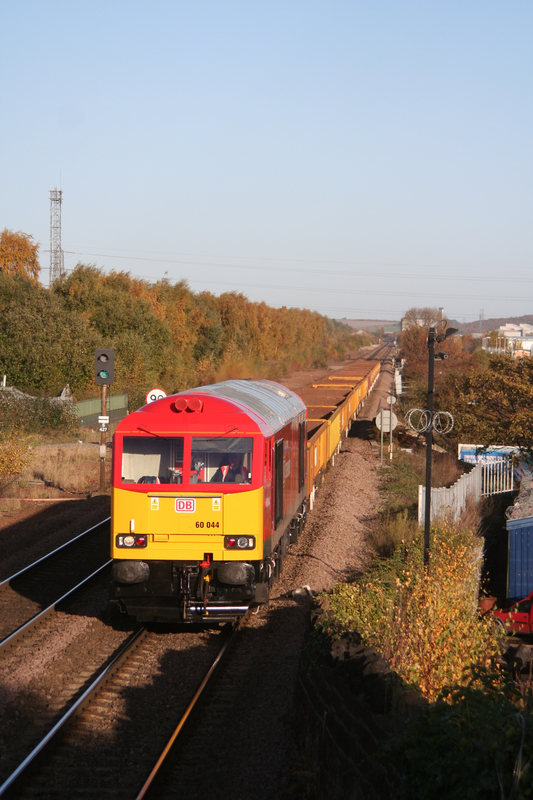 Rotherham Masbrough, 14th November 2013: Ex-works 60044 heads south with a Doncaster - Toton engineers, comprising a rake of empty ballast hoppers, which are at the opposite end of the cleanliness spectrum! 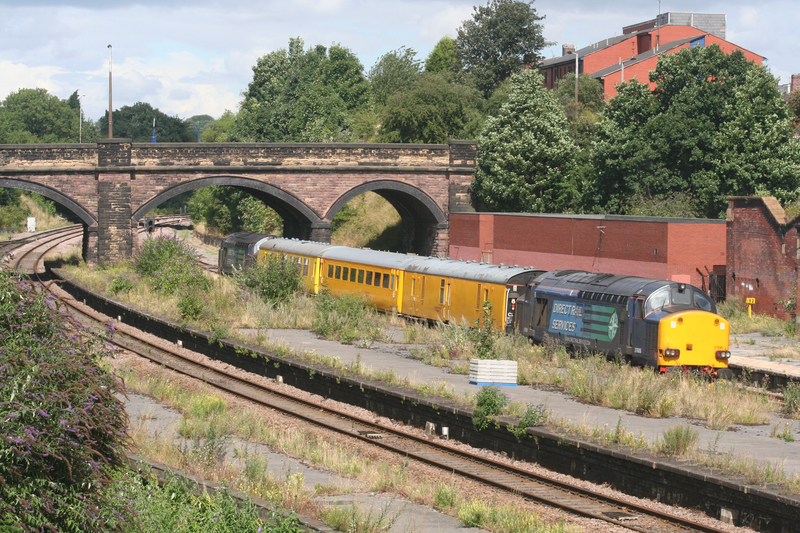 Rotherham Masbrough, 12th August 2013: Waiting amongst the weeds and deriliction of the long-closed station are Direct Rail Services' 37608 and 37606 with a short 3-coach Network Rail test train, heading from Derby to Heaton, Newcastle. Leeds, 16th November 2016: Awaiting departure with the 19:22 stopper to Doncaster is Northern's newly-refurbished 158752. A growing number of 'OO' British-outline models are being sold with 'factory-finish' weathering - trains in reality very quickly build up a layer of grime and their ex-works shine is dulled somewhat. At this point the 158 was only weeks out of Kilmarnock works, and yet was already covered in brake dust and road dirt! 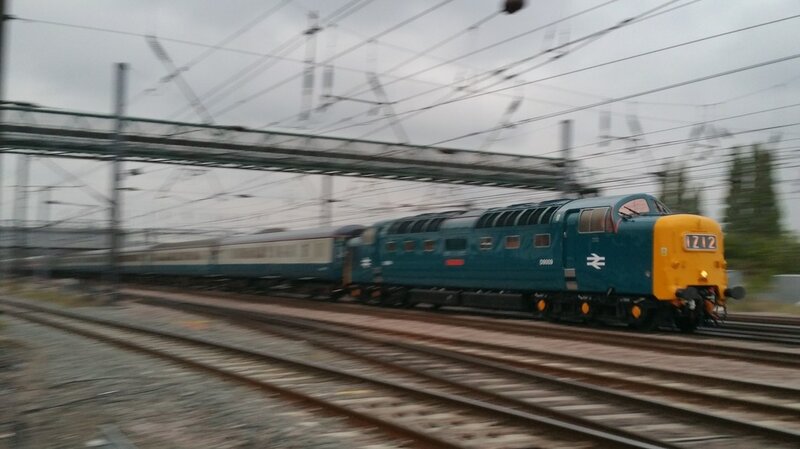 Doncaster, 6th May 2017: Preserved in late-1960s condition, Deltic D9009 'Alycidon' hauls the return leg of a London Kings Cross - Leeds charter, complete with a matching rake of blue/grey Mk2 air-cons. 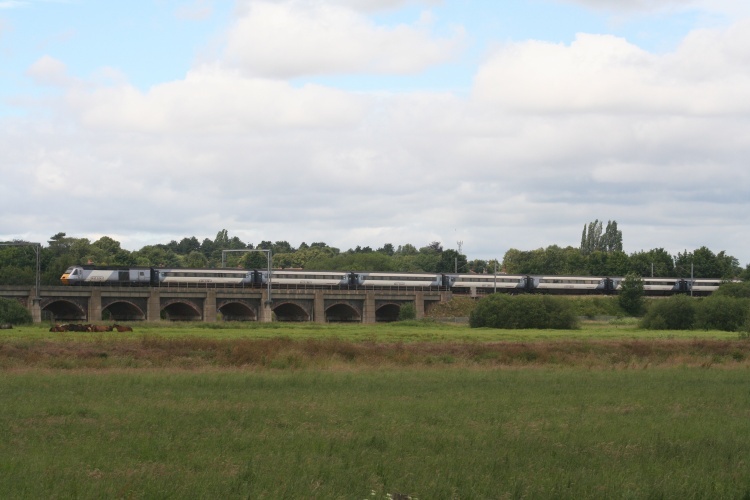 Direct Rail Services' 68022 remained on the rear of the formation for the run from Leeds to Willington. Oxford, 3rd May 2017: Standing in the building site that is Oxford station is Great Western's 165106, performing a shunt manoeuvre from the up-side sidings to platform 1, prior to forming an evening stopping service to London Paddington. 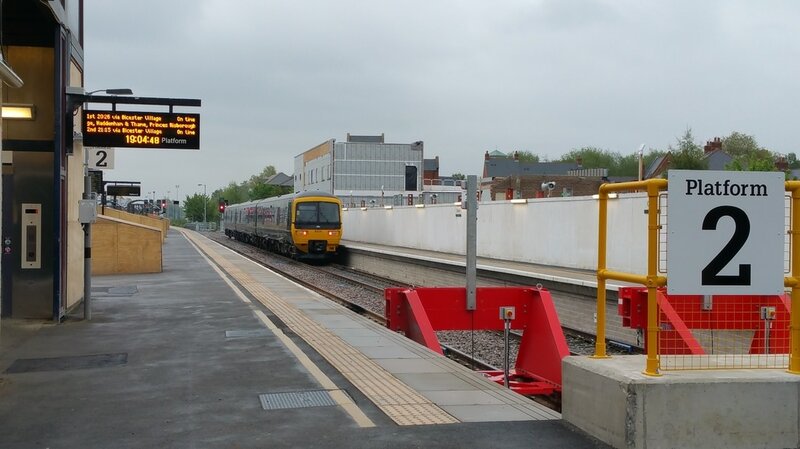 The works affecting Oxford are in relation to the service improvements towards Bicester. Birmingham New Street, 3rd May 2017: Clashes in architecture as the newly revamped Grand Central/Bullring centre stands against more austere 1960s/1970s brick blocks. Meanwhile, Cross-Country's 43358 prepares to depart with 1V54 to Plymouth, and a 170/5 stands idle between duties. Aylesbury, 3rd May 2017: Another style of architecture, with the ex-Great Central station standing amongst modern township apartment blocks, with the former goods yard taken up by car parks. The picture was taken from a large pedestrian footbridge which clashes horribly with the surrounding area. 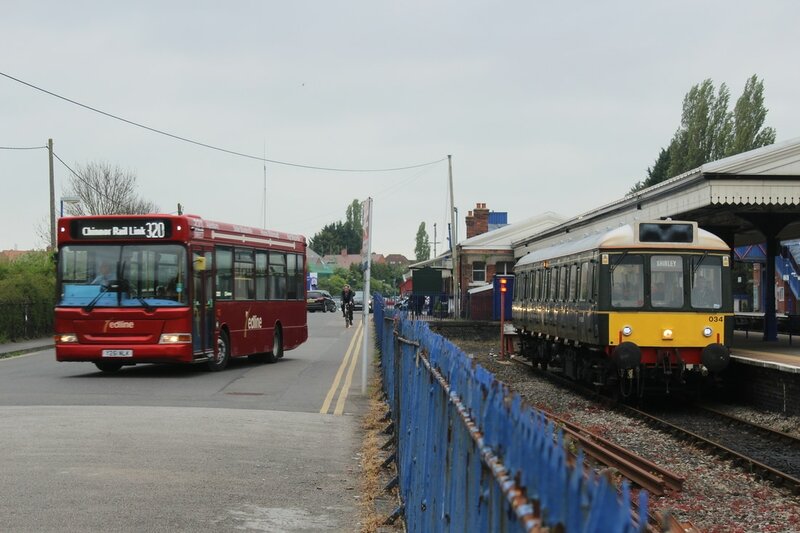 Princes Risborough, 3rd May 2017: A real-life version of Daisy the Railcar and Bertie the Bus, a scene which is now no more after the withdrawal of the last 1st-generation DMUs operated by Chiltern Railways. As the shuttle service to Chinnor departs, 121034 awaits departure with one of the evening peak Aylesbury services - the load factor probably increased 3-fold due to enthusiasts sampling a final trip on the DMU!